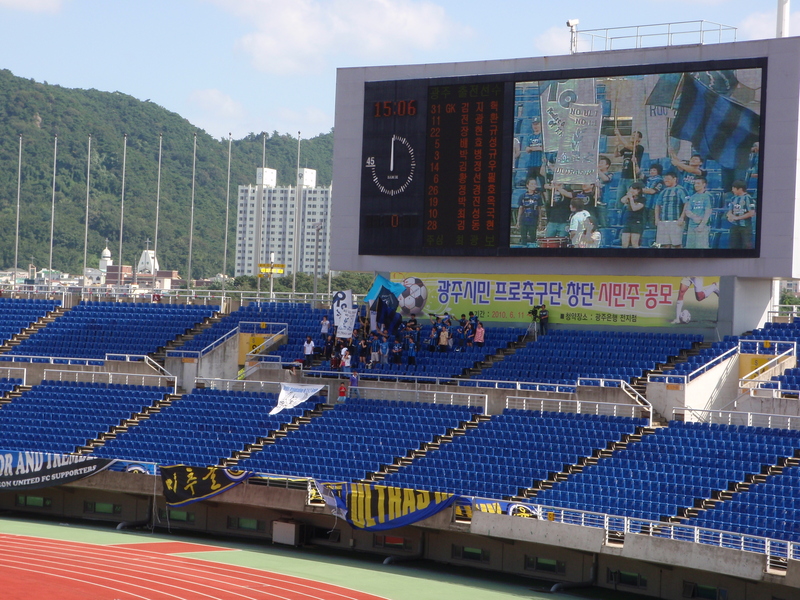 Jen and I had been over to Gangneung the previous day for some hiking and football. 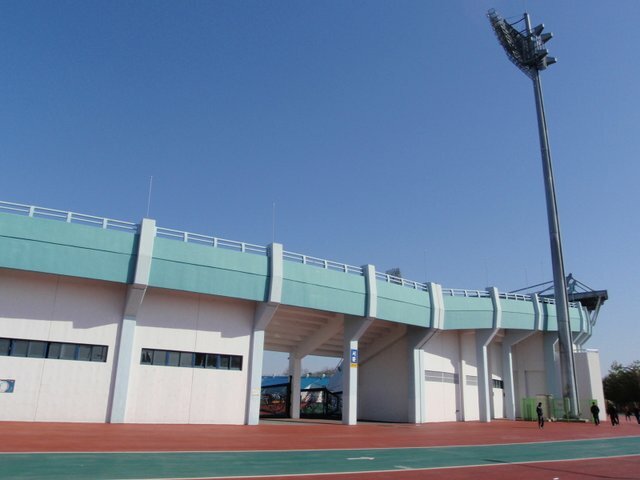 On the Sunday morning she caught the bus back to Seoul whilst I got one to Icheon to watch the FA Cup second round tie between fourth division Icheon Citizen and third division Busan Transportation. 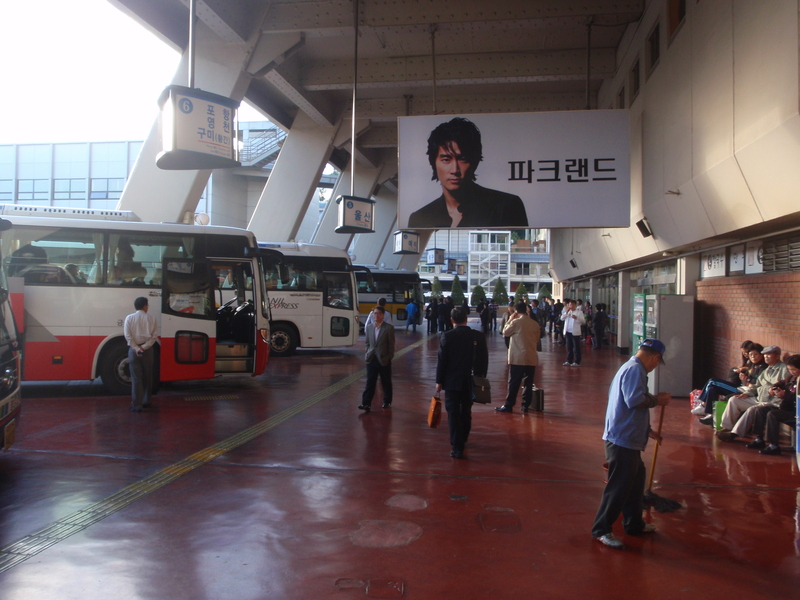 I can’t help but be impressed by the bus system in Korea. The fares are cheap, the seats comfortable and best of all the network covers a remarkable variety of direct routes between places that I can’t see why people would ever want to go from one to the other. If only the passengers could avoid shouting at each other all the way through the journey it would be pretty much perfect. 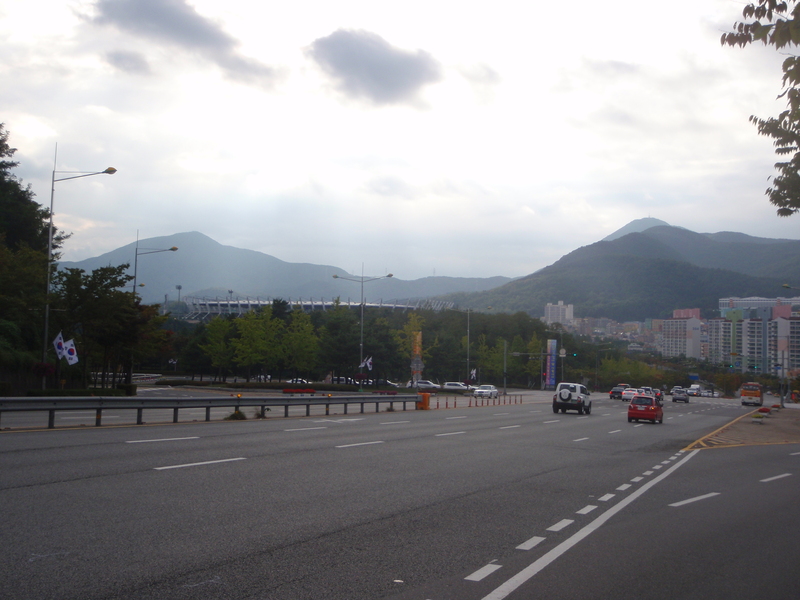 Two hours after setting off I was in Icheon and with a further two hours to spare until kick-off I decided to walk to the stadium. I’d found it on the map on my phone and so just used the blue dot GPS thing to get myself there. I had to cross a few fields where I watched farmers doing all the stuff that farmers do and I was barked at by half a dozen dogs or so. Once I got back into civilisation I picked up a few cans of beer before squeezing in an eight minute haircut at a salon that seemed more like a social club for the town’s pensioners than a place where much actual barbering went on. Navigating with the blue dot. 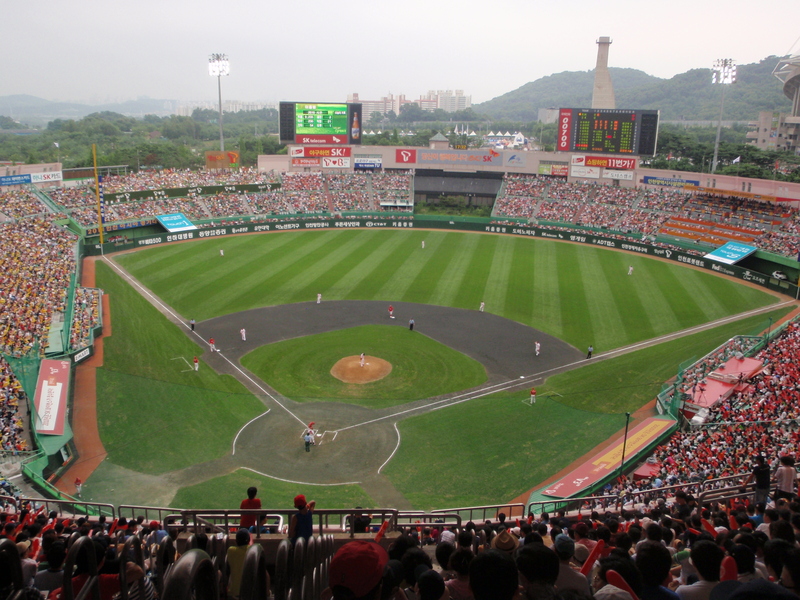 It got even better at the end of the hour and a half walk as I stumbled across games taking place on the two Icheon practice pitches next to the stadium and I had a look at those for a while before making my way in through the main entrance. 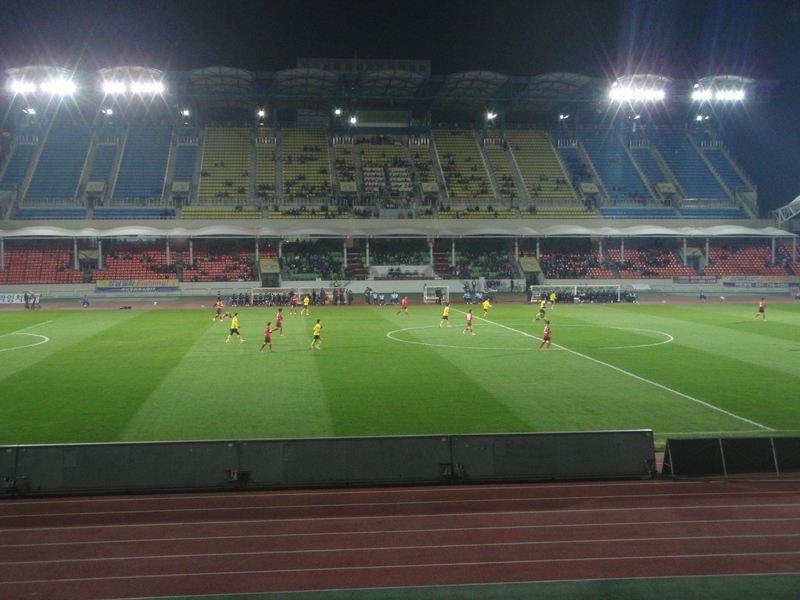 The match had already kicked off by the time I took my seat, with Icheon in blue and Busan in their away kit of red and black stripes. I had a quick tot up of the crowd and estimated that there were about a hundred there. 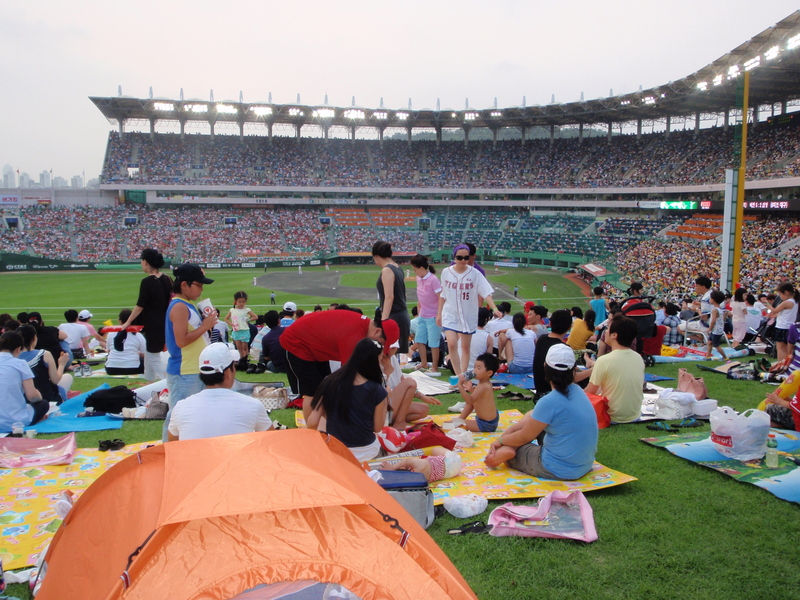 It didn’t surprise me that there were more fans watching the games outside as those local tournaments always seem to attract a decent following. 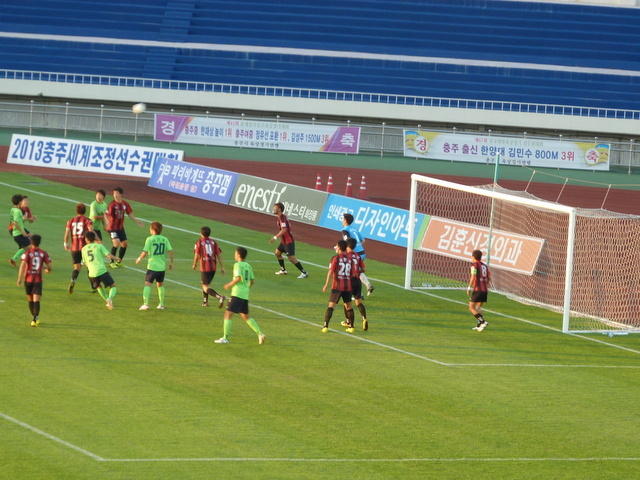 Icheon took the lead from a penalty inside the opening ten minutes. I missed the foul but the home players seemed pissed off that the Busan defender responsible escaped with just a yellow card. The rest of the first half was fairly scrappy, with both teams happy enough to lump the ball forward and fight for possession. 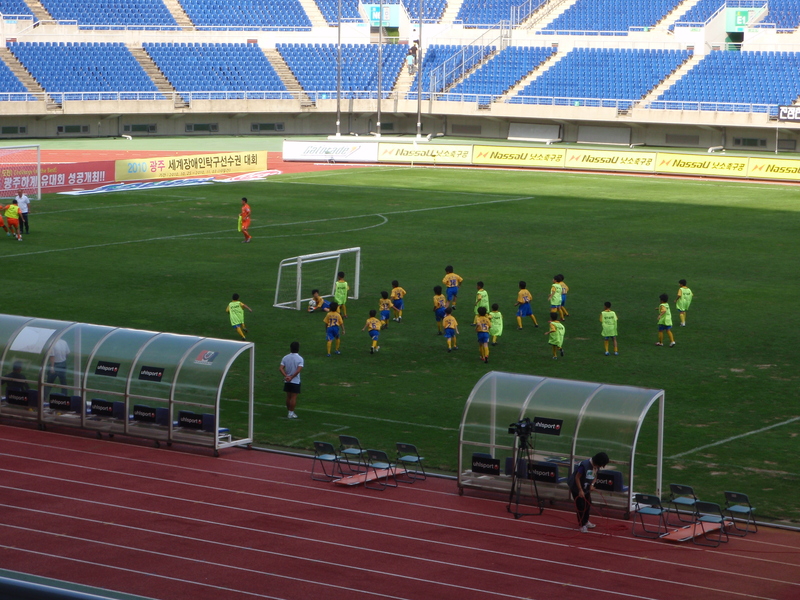 Busan drew level bang on half time with a glancing header. 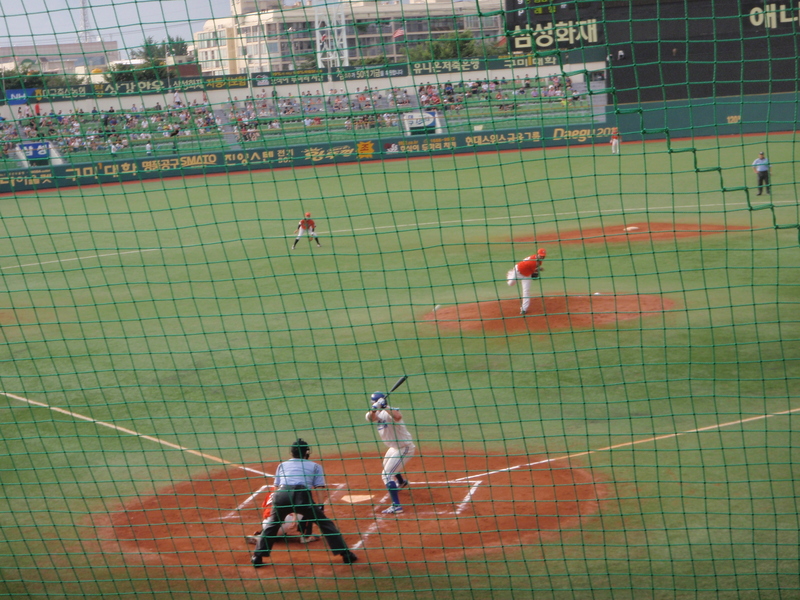 There wasn’t even time for Icheon to kick-off again. In the second half both teams continued to miss chances. One in particular from a Busan striker almost had my beer coming out of my nose as he somehow contrived to put his shot over the bar from close range. 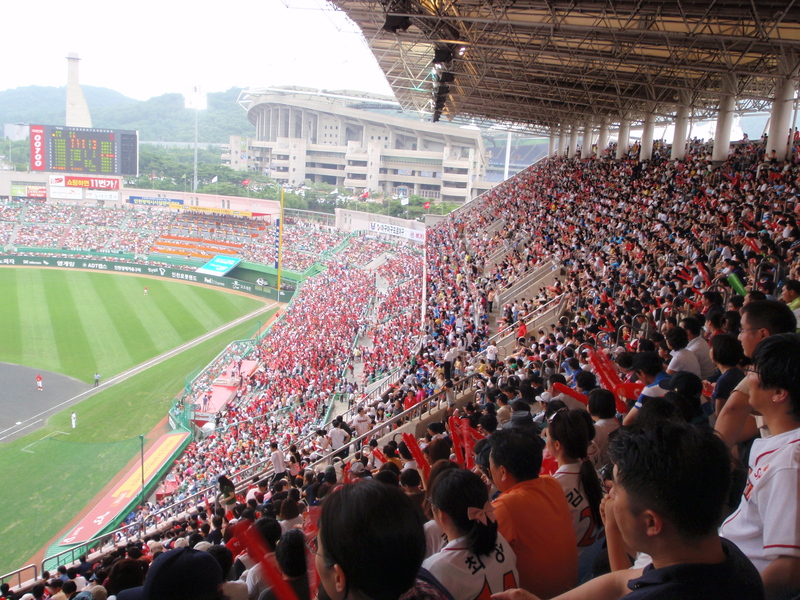 Ten minutes from time, Icheon nicked the win and the place in the third round when a decent through ball was finally capitalised upon and blasted home. I got lucky on the way out and managed to flag a bus down for the ride back to the terminal where it was easy enough to pick up a bus for Dong Seoul. 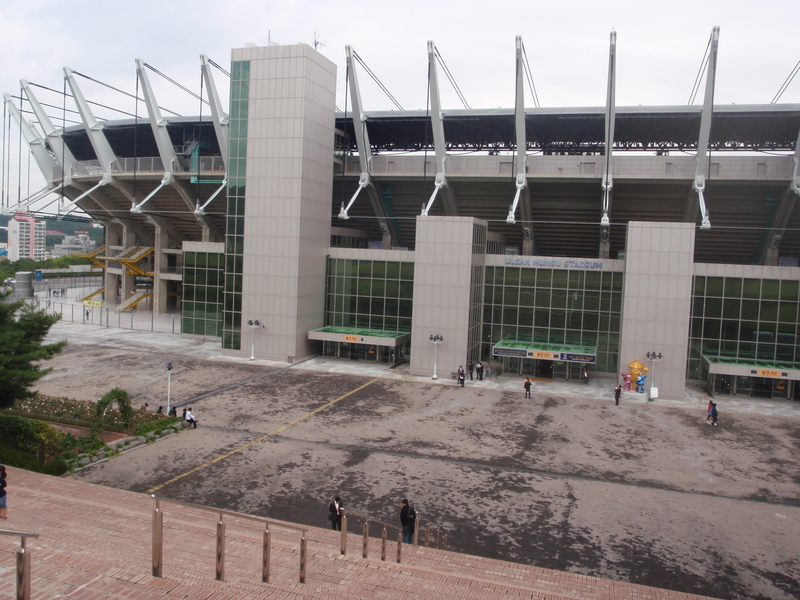 On Sunday I got the opportunity to visit another of the World Cup stadiums. 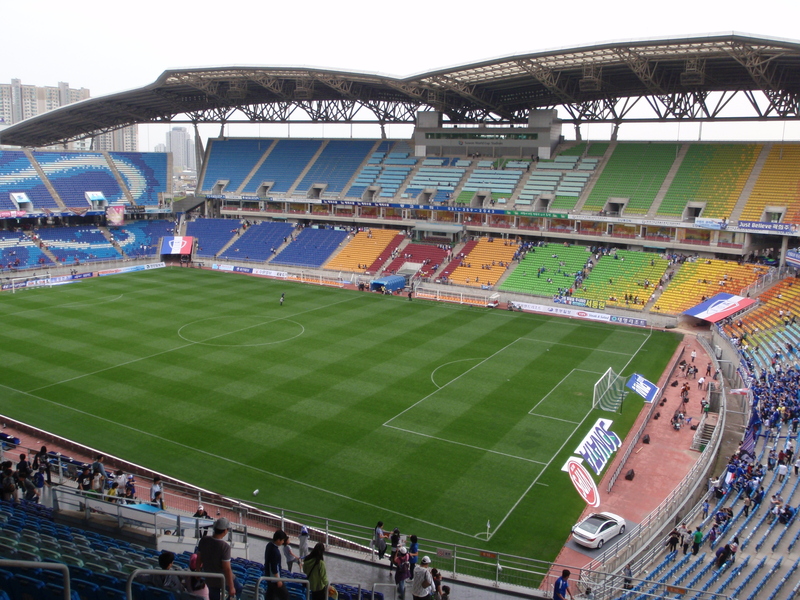 One of the hiking groups that I’m in were walking along the coast from Buan to Gyeokpo on the Saturday, so it seemed a good opportunity to combine that hike with a trip to nearby Gwangju and the Guus Hiddink Stadium the following day. 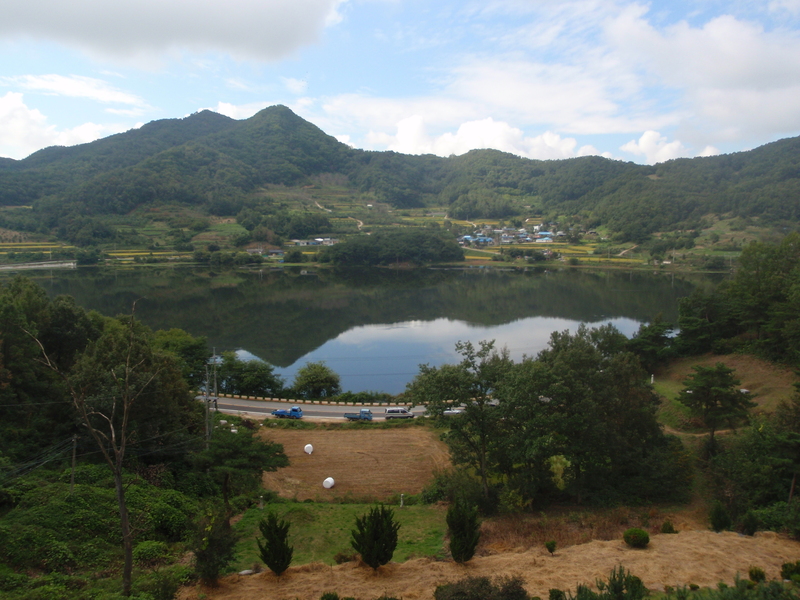 Buan is in the south west of Korea and with the hike setting off at 11.15am, Jen and I got the bus from Seoul at 7.50am. 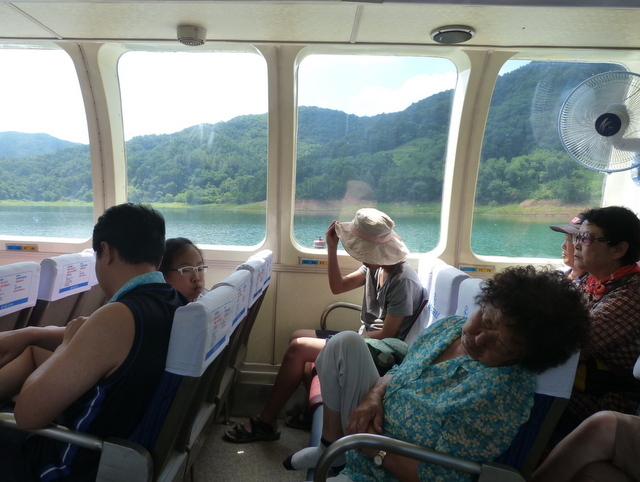 The weather was pretty bad for most of the journey, with heavy rain until we got close to Buan. The bus was about fifteen minutes late arriving and when we got off at the terminal there wasn’t anyone around who resembled a hiker. 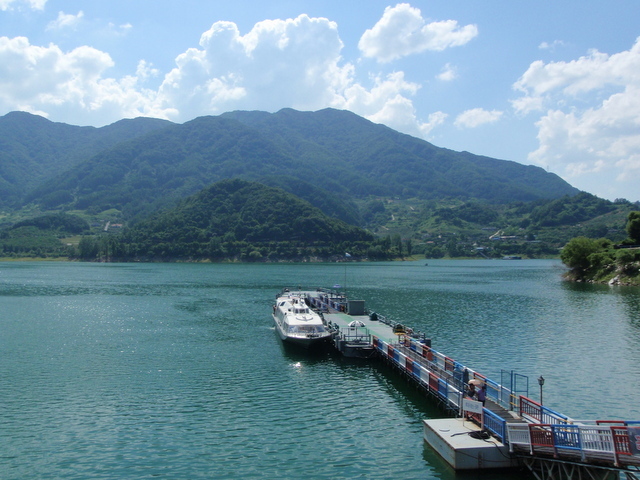 If it had been raining in Buan we would probably have forgotten all about the hike. The weather was fine though and with the route following the coastline meaning that we were unlikely to get lost we took a taxi to the sea wall starting point of the nineteen kilometre trail. We had a bit of luck when we got there as I recognised a girl who I’d walked with before and we soon caught up with the other seven members of the hiking group. 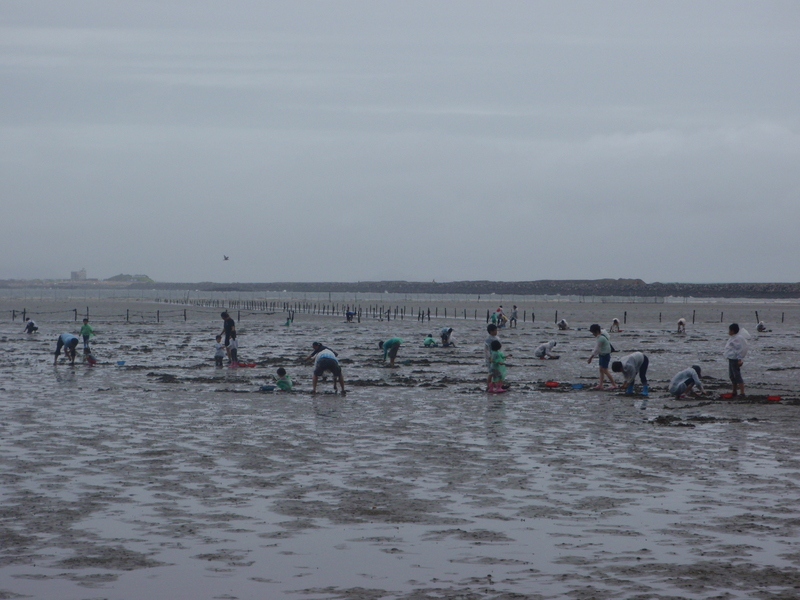 The first 6km or so followed the beach where we saw families digging for something, possibly clams, maybe some sort of razorfish. 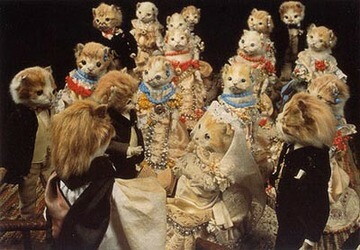 I’ve no idea what they were doing to be honest, they could have been burying their grannies for all I knew. I saw a few of those flying fish that jump out of the water, some of them quite close to the shore. 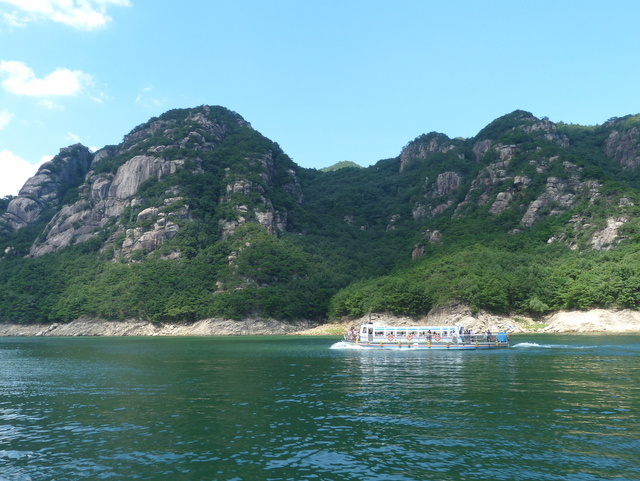 There were also plenty of locals in the water, all of them overdressed, as is the way it’s done in Korea, some of them to the extent that they were wearing tee shirts, jeans and trainers. 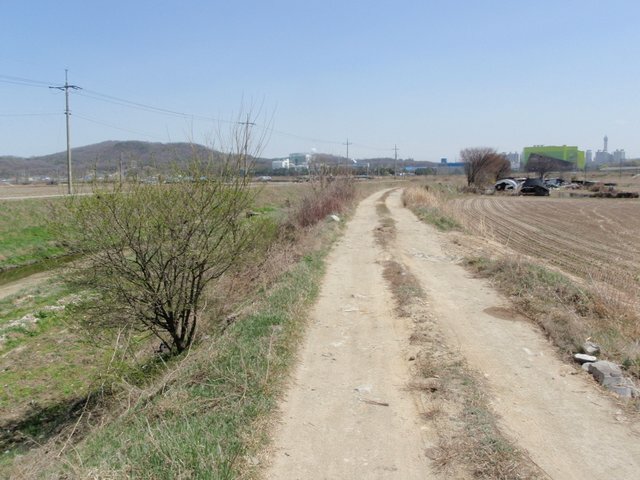 The second stage of the trail took us up into the woods where we passed a lot of army outposts and huts, providing coastline defences and training opportunities. It started to rain around this time. It was a hot day though and with the humidity I wasn’t convinced that I’d be any drier if I put my waterproofs on. 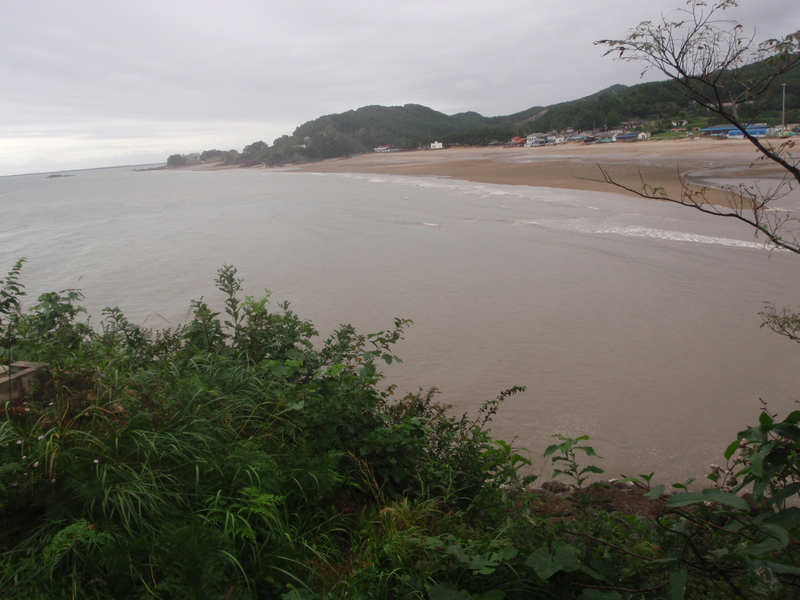 The final third of the hike was on roads, mainly due to us getting lost, and by the time we arrived at Gyeokpo beach, I was pretty much soaked through. I wasn’t as wet as two days earlier though. I’ve recently started playing five a side out here and we had played our first match that week in the rain that accompanied the hurricane. 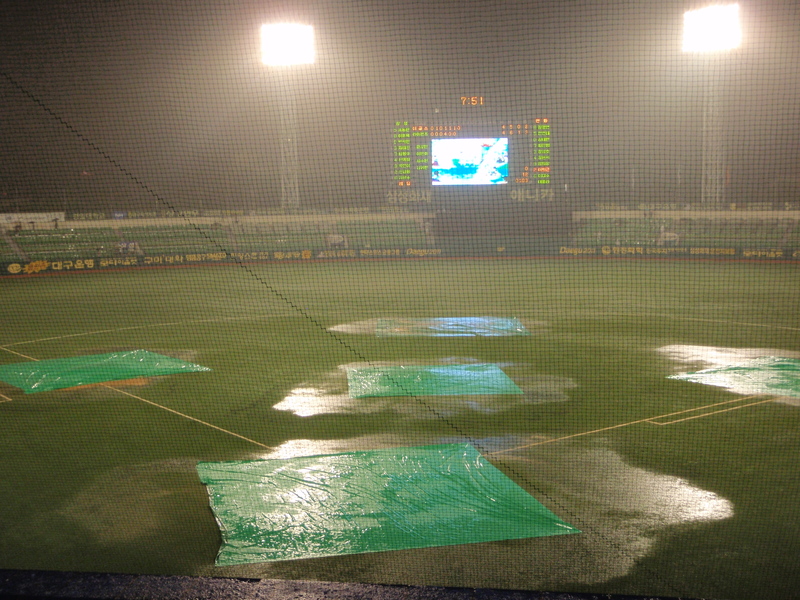 By the end of the game there were pools of water all over the pitch. We left the rest of the hiking group at the bus station and checked into a hotel by the beach. 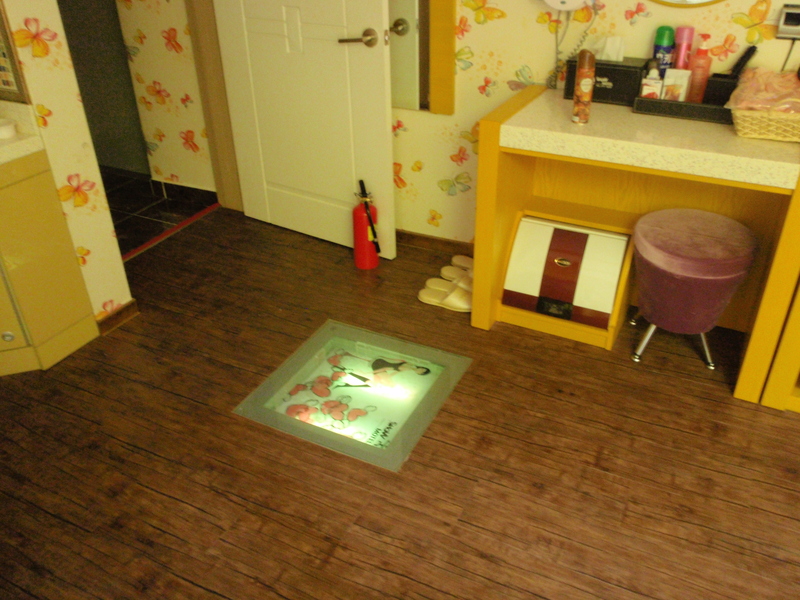 It was a hundred thousand won for a room with a sea view and a balcony. It was probably the best room in the hotel, on the top floor with the window coming down to floor level and then taking up virtually the whole wall that faced the sea. 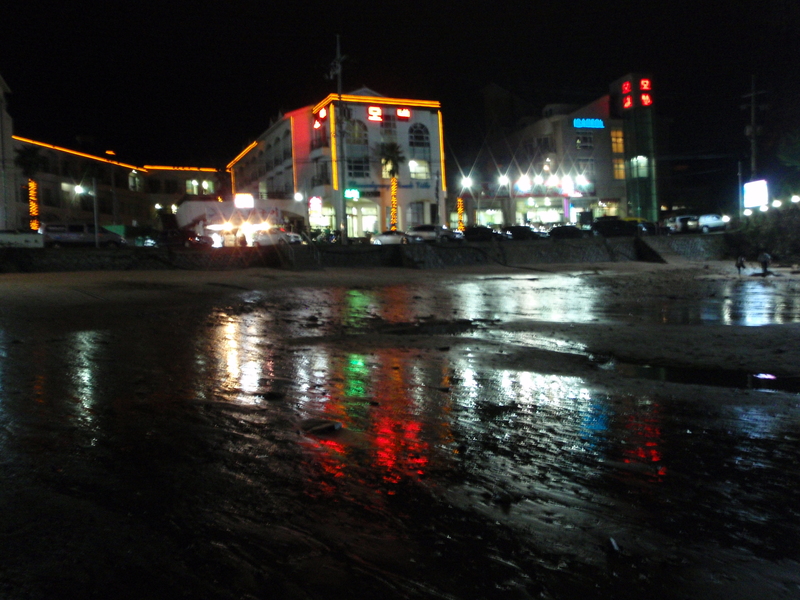 After calling into a restaurant for a variety of seafood including some small ’cut in half’ crabs in a stew that I probably expended more calories trying to extract the meat from than I took in from eating them, we headed back to the hotel. In the foyer they had an umbrella stand that was well stocked with fireworks. I don’t know how the various guides allocate stars to hotels but if I was doing it then a bucket full of fireworks in reception would be enough to guarantee an extra star or two. 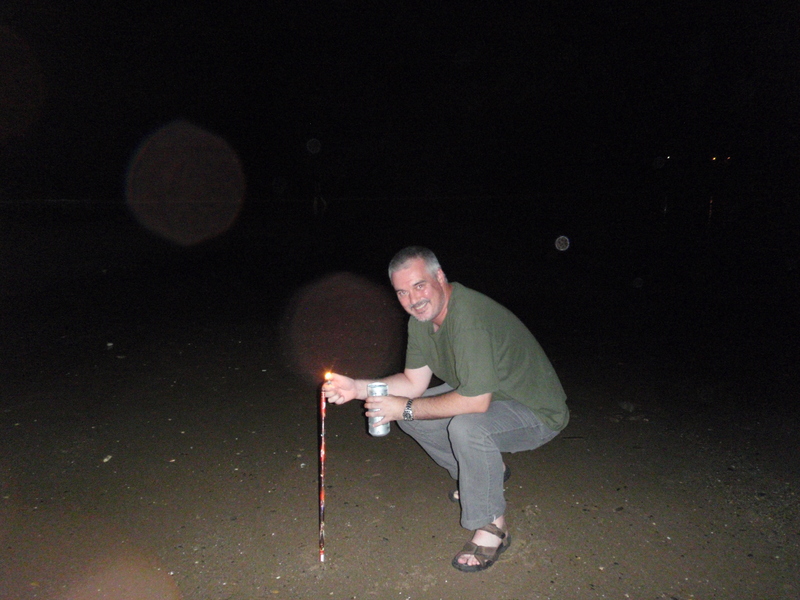 We bought four of them for a total of ten thousand won and set them off reasonably responsibly on the beach. By reasonably responsibly I mean that we stuck them in the sand. Can of beer to responsibly douse stray sparks. We did light a couple at once, which I believe the Firework Code frowns upon, but that was nothing compared to the way the Koreans let them off. 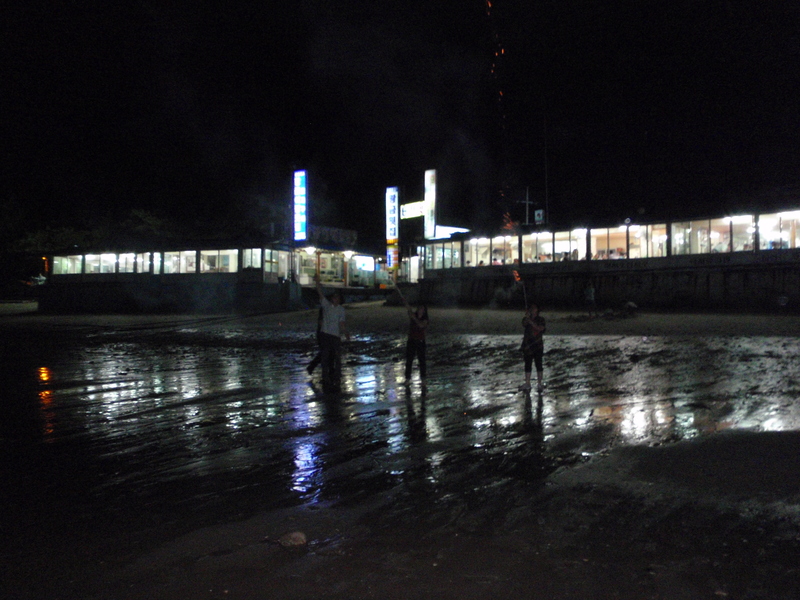 Adults and children alike all just held them at arms length and fired them one handed down the beach. And this is how the locals do it. 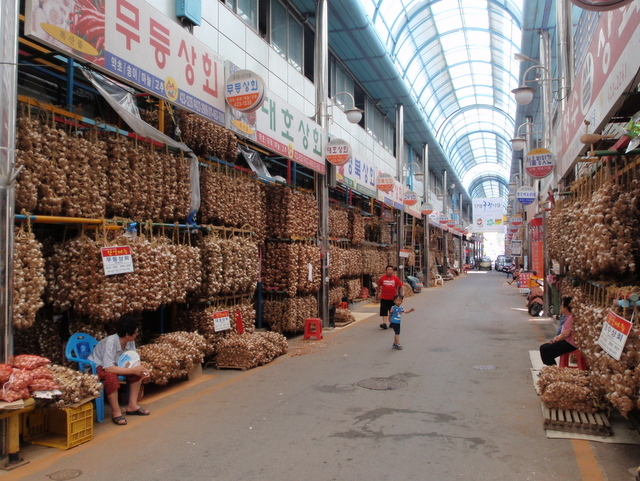 The next day we got a local bus to Buan and then a slightly less local bus to Gwangju. 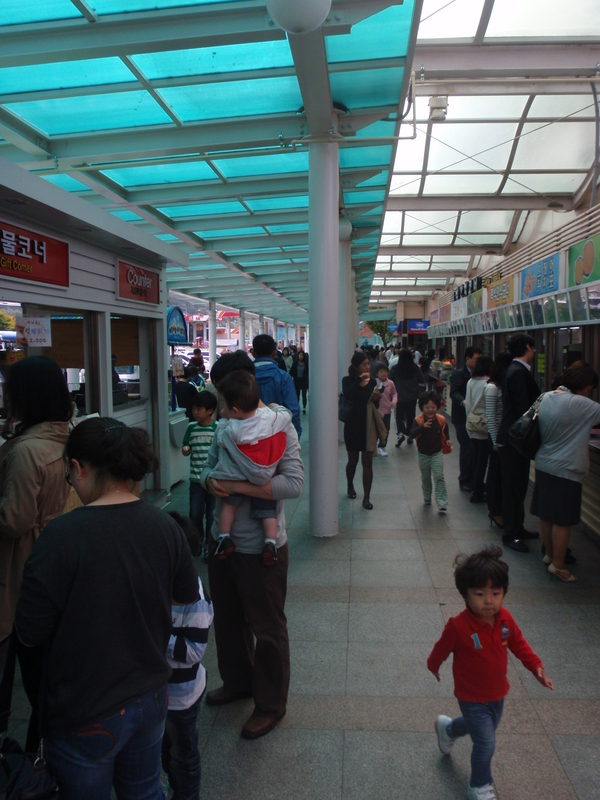 By the time I’d had some bulgogi for lunch there wasn’t really much time for any sightseeing which was a shame. 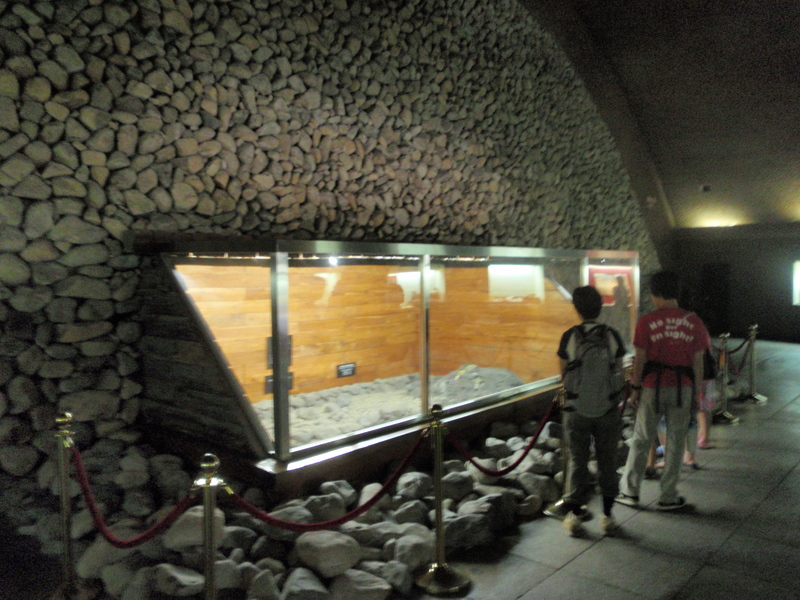 Gwangju is famous for a massacre of protesters demonstrating against the military government in 1980 and there is a cemetery and museum that I was quite keen to see. I did have time for a haircut though, notable for the look of horror on the hairdressers face as she shaved it down to the requested three millimetres. 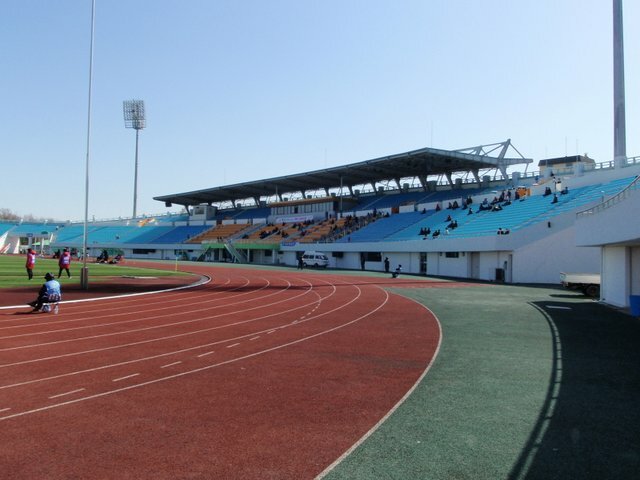 We got to the stadium about an hour before kick off and it was an impressive sight with curved roofs on each of the two stands along the sides of the pitch. Not for the first time I regretted that my camera was incapable of taking wide angled photographs. The stadium had been renamed after the World Cup to honour Guus Hiddink’s achievement in taking the team to the semi-finals. 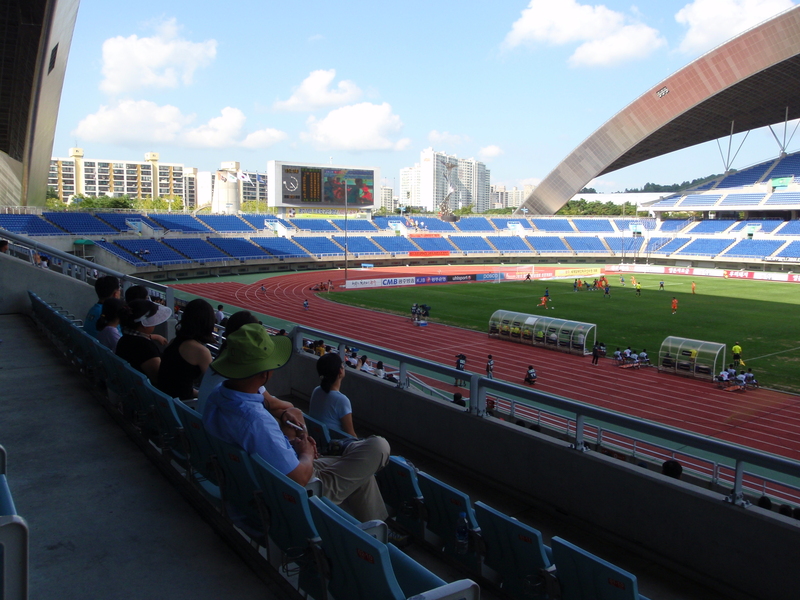 One of the games that it staged was the Spain v South Korea quarter final that the Koreans won on penalties after a goalless draw. 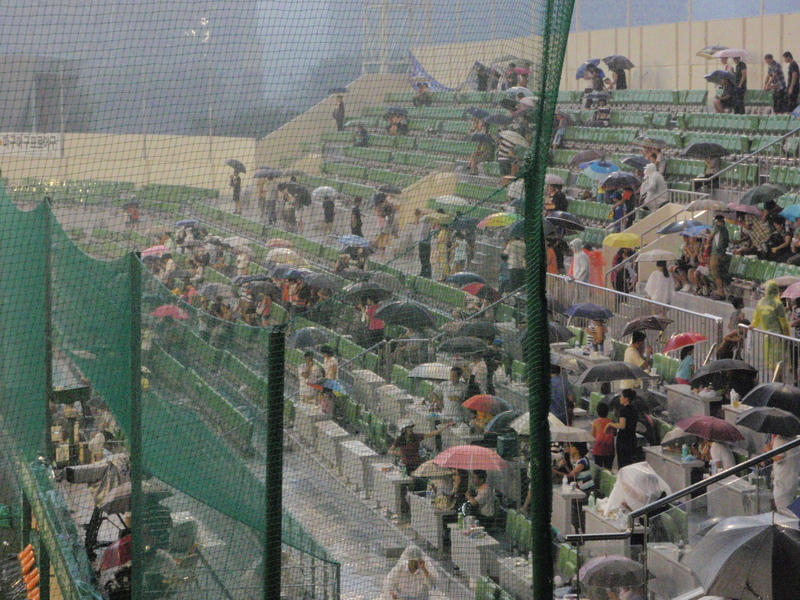 I suspect that might have been the last time that the stadium was full. 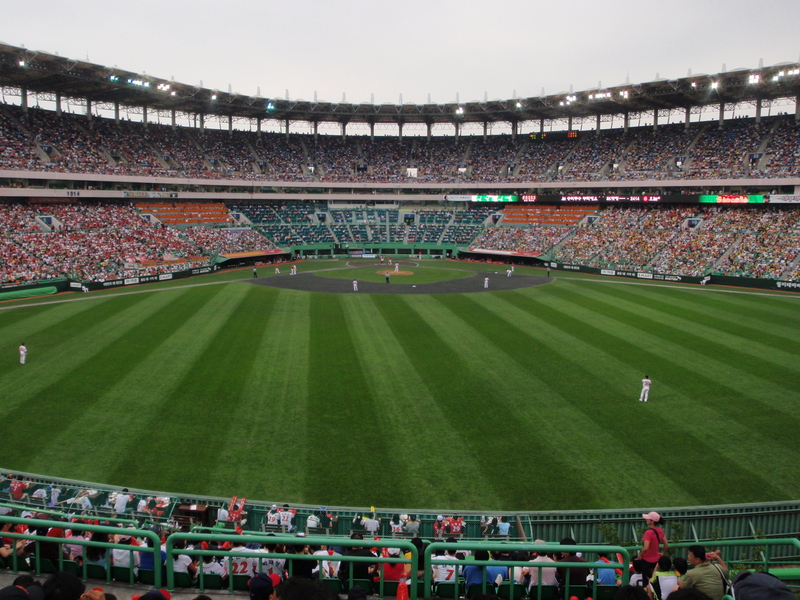 We got a couple of tickets for seven thousand won apiece and made our way into one of the stands with a curvy roof. If we’d wanted, we could have sat in the media section, complete with little tables, but it was a bit windy so we went down to the lower tier instead and sat in what looked like a VIP section. I’d had a look for somewhere selling beer but couldn’t see anything, although I can’t have been that desperate as there was still time to nip back outside and pick up a couple of cans if I’d wanted. 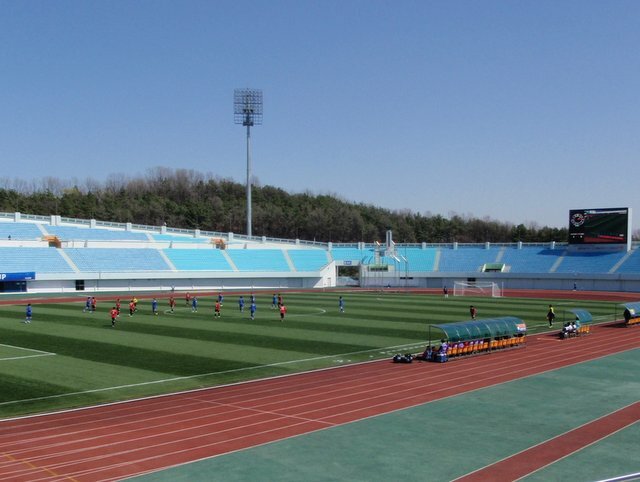 Whilst the stadium still looked in decent nick, the pitch was poor, with a lot of bare patches.Gwangju Sangmu, the home side, are actually the army team. 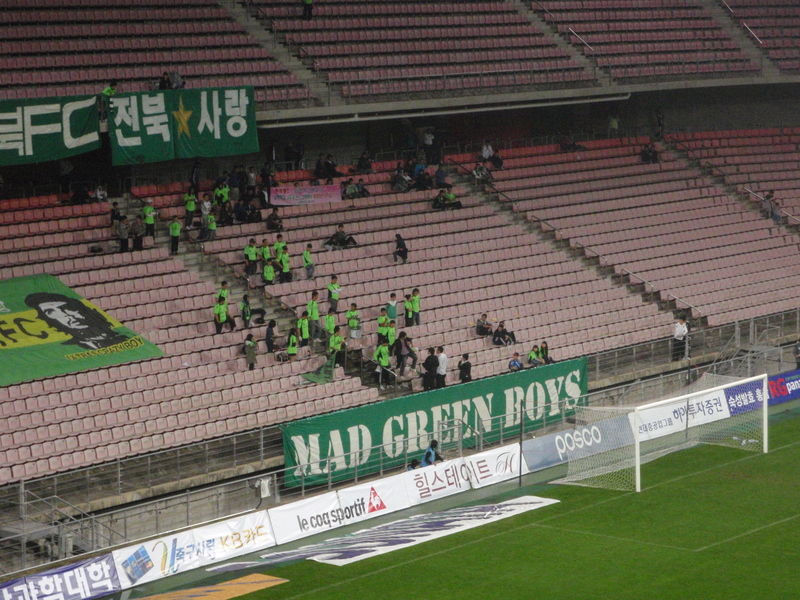 They have been playing in the K League since 2003 when the Korean footballing authorities decided that they would like all of the former World Cup stadiums to be occupied and in a move that strikes me as a little insensitive, moved the army team into the city where the massacre by the military had taken place twenty three years earlier. The team is made up of professional footballers who have had their careers interrupted by compulsory military service. All men over here have to serve at least twenty-one months in one of the armed services. From what I can see the only exception seems to be Olympic gold medal winners and the team that reached the semi final of the World Cup in 2002. 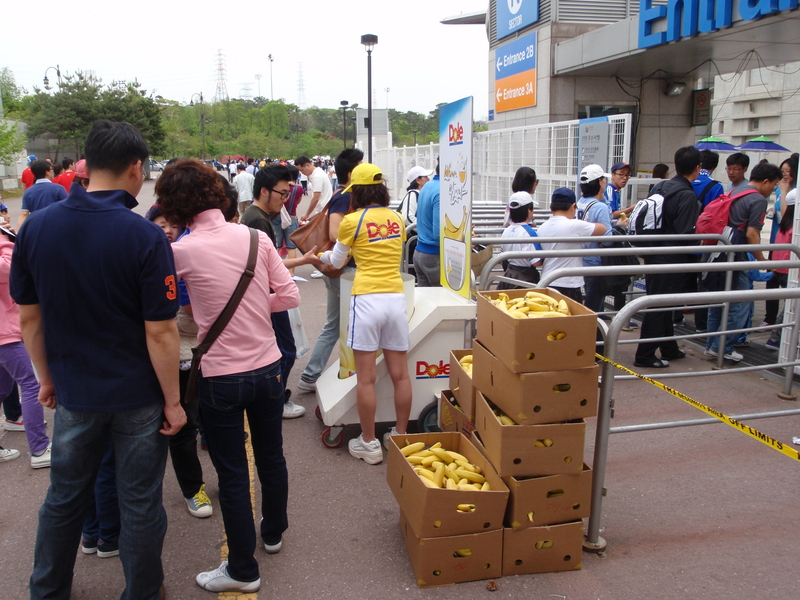 Lee Dong Gook was left out of that squad by Hiddink who perceived him as being a little on the lazy side and he ended up playing for Gwangju Sangmu whilst doing his national service between 2003 and 2005. I wonder how often he cursed his former national manager as he got out of bed at 6am to march up and down the parade ground. 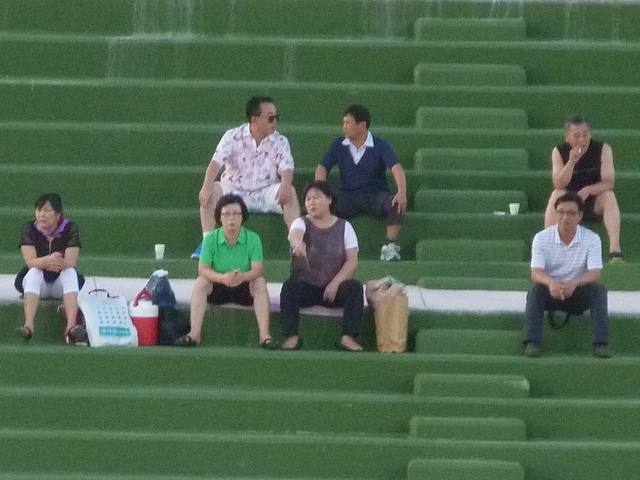 You might remember Kim Jung Woo from this summer’s World Cup. 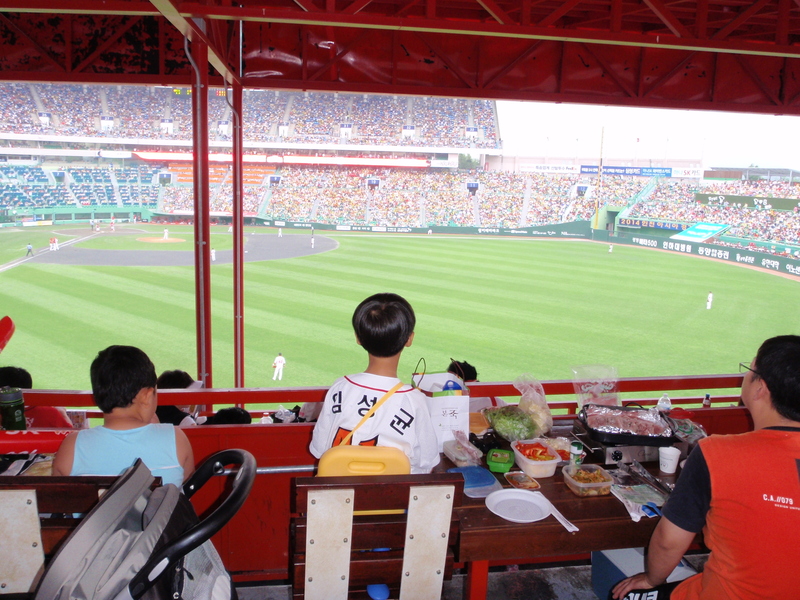 He was the lad who saluted during the South Korean national anthem. Well he was playing, no doubt regretting that they had been knocked out at the last sixteen stage. Two more wins and he could have given up wearing khaki for good. 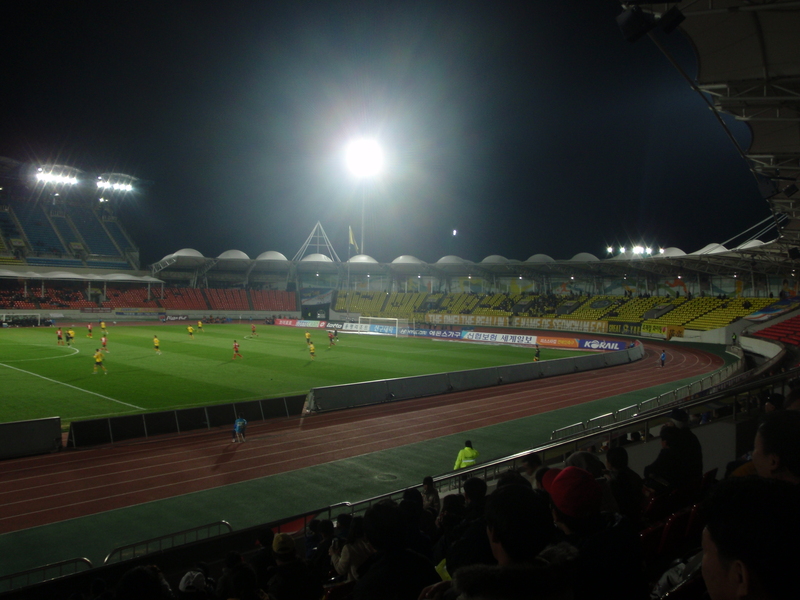 The away team were Incheon. I’ve seen them a couple of times already this season and they are struggling a bit. In fact, going into this game they hadn’t won in the league for ten games, a run that stretched back to the end of May. 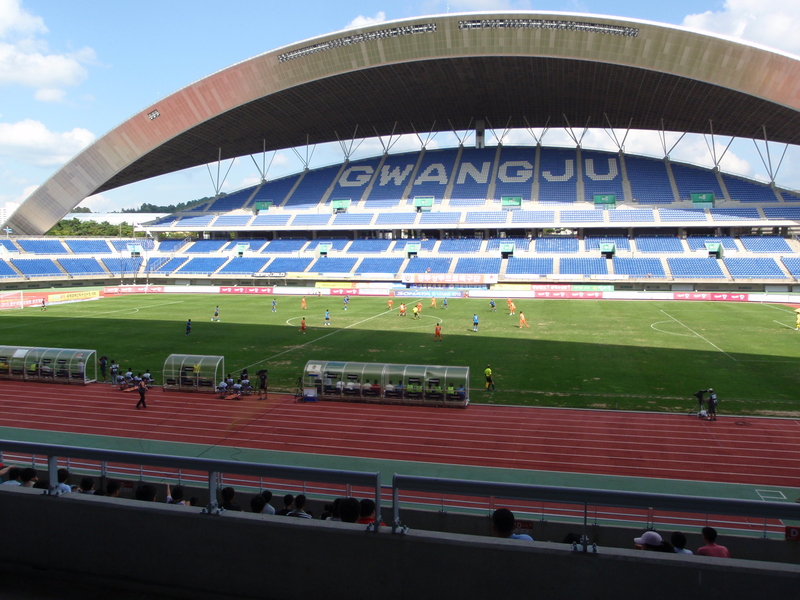 Mind you, Gwangju Sangmu were on an even worse run, it was early May since they had picked up three points. So, what do you reckon, nailed on draw? 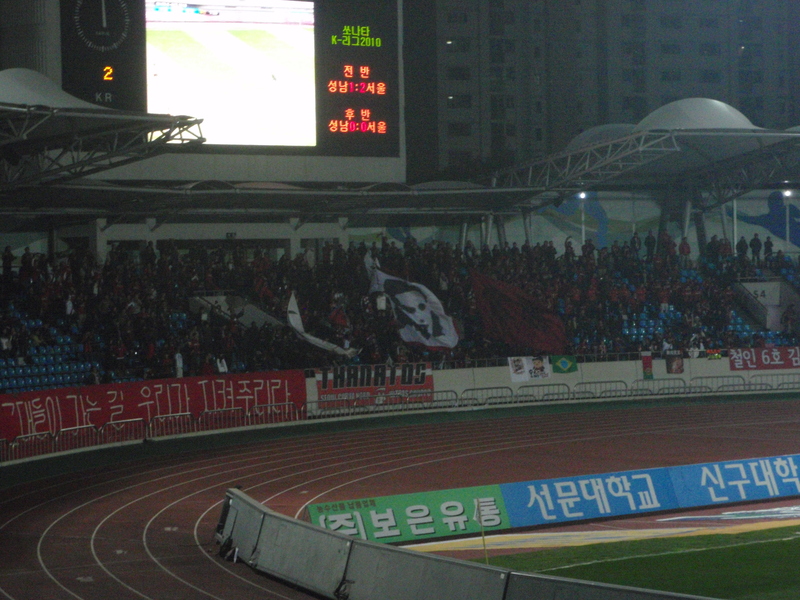 Incheon, who have a pretty decent travelling support normally, had brought about thirty fans with them. 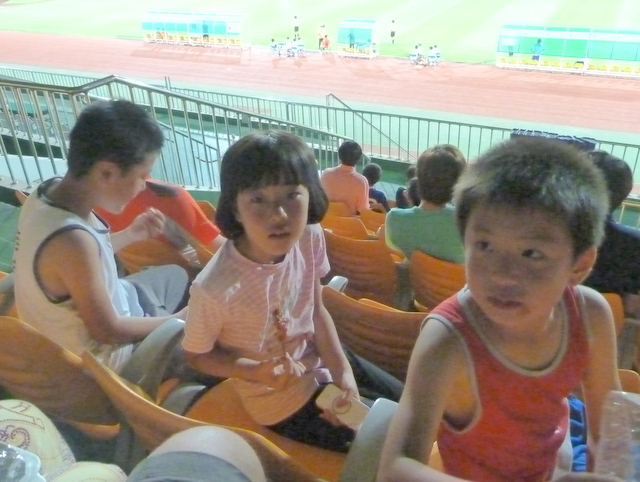 At the opposite end of the stadium, the Gwangju ’ultras’ consisted of six sorry looking kids, although with the benefit of a couple of loudhailers they did make a bit of noise. It isn’t often that a team has more players than fans. Actually, they had more substitutes than fans. Bless. 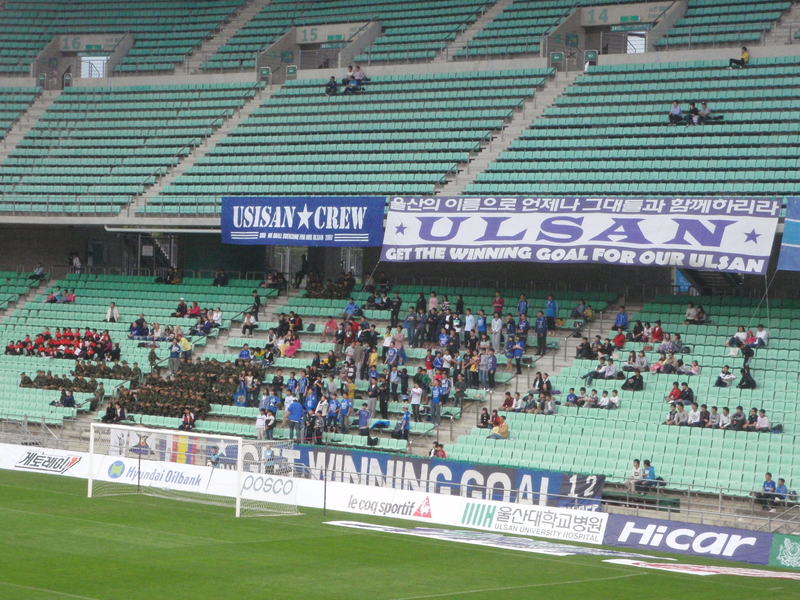 Look very closely behind the goal and you can see the Gwangju fans. 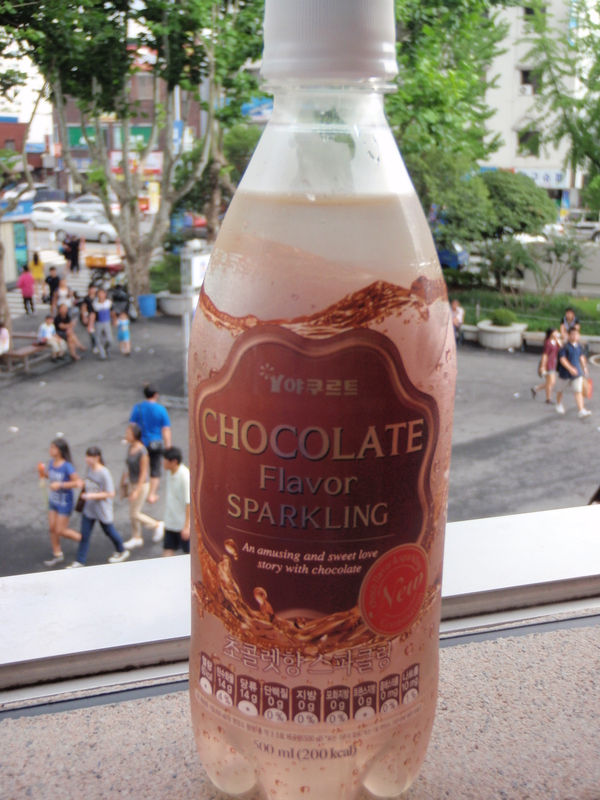 It didn’t take Incheon long to go ahead. 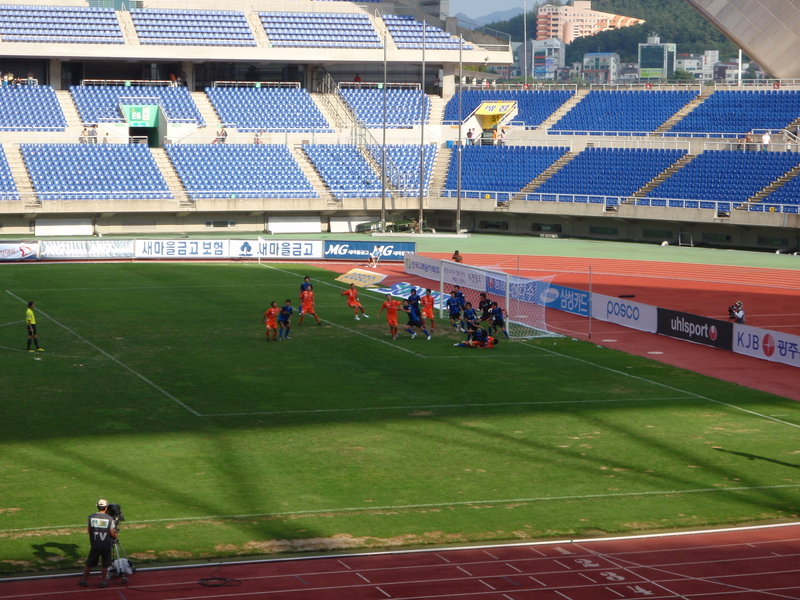 Their Brazilian striker Bruno Correa robbed a Gwangju defender and squared for Young Byong Soo to tap home from close range. 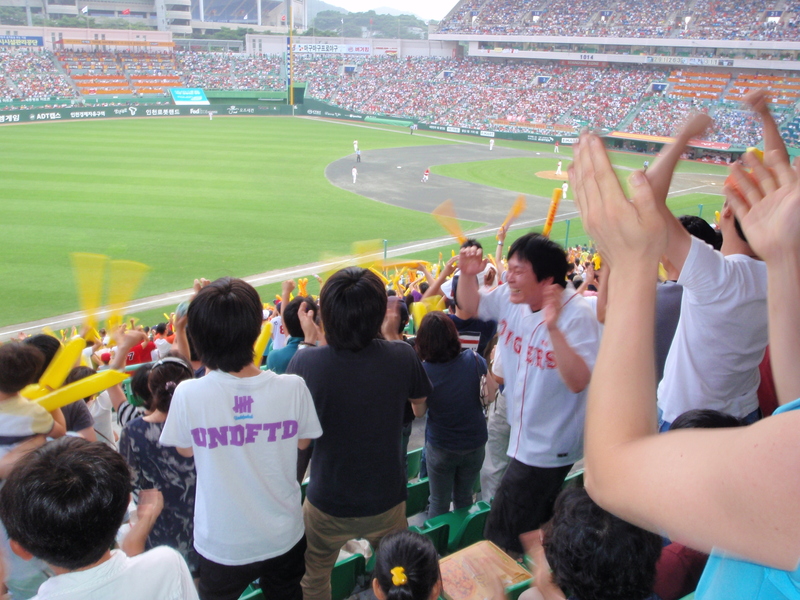 The thirty Incheon fans, sensing their first win since before the World Cup break celebrated with a song using The Beatles tune ’I Will’. The Army side fired in a couple of long range scuds from outside the box but apart from that didn’t really threaten for the rest of the half. At half time we were treated to an eleven a side game between some young kids on a coned off pitch that was smaller than the one I’d played five a side on two days earlier. In classic schoolboy fashion all twenty outfield players chased the ball around the pitch, although if they had spread out a bit it probably wouldn’t have looked a whole lot different. One was so small that his bib came down to his ankles. Still, I suppose it will stop him getting rusks on his football shirt. 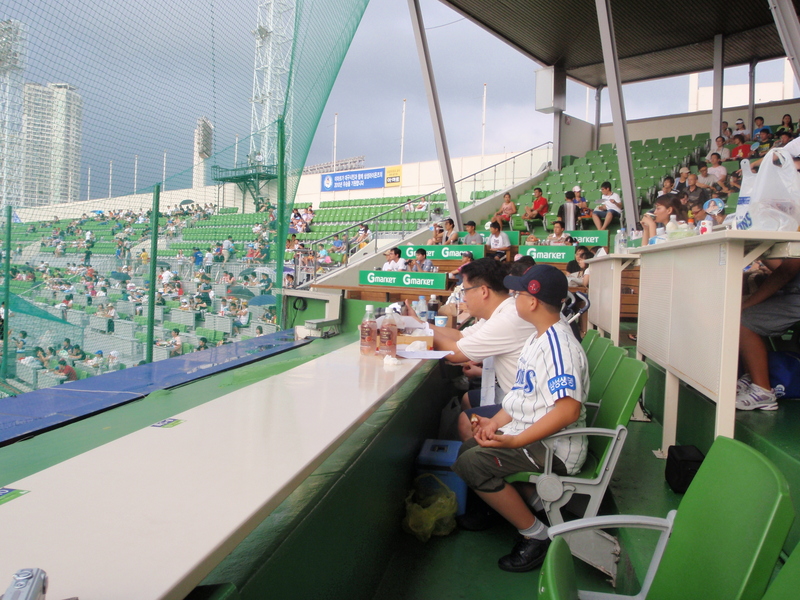 Their parents trebled the attendance. 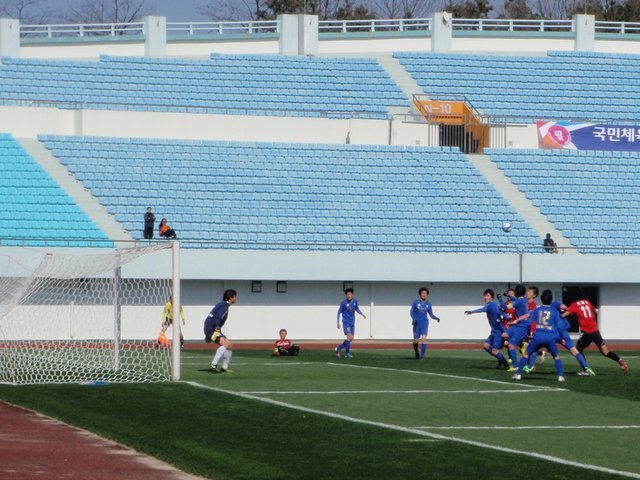 In the second half Incheon had a couple of chances to put the result beyond doubt. 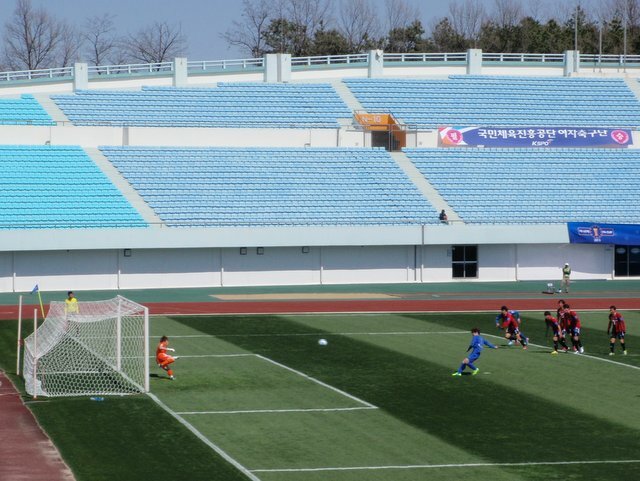 Substitute Nam Joon Jae looked as if he might have been brought down as he shaped to shoot and then in the last couple of minutes they hit the bar after taking the ball off a Gwangju defender who for some reason was dribbling along his own six yard box. A court martial offence worse than shooting General Melchett’s pigeon. 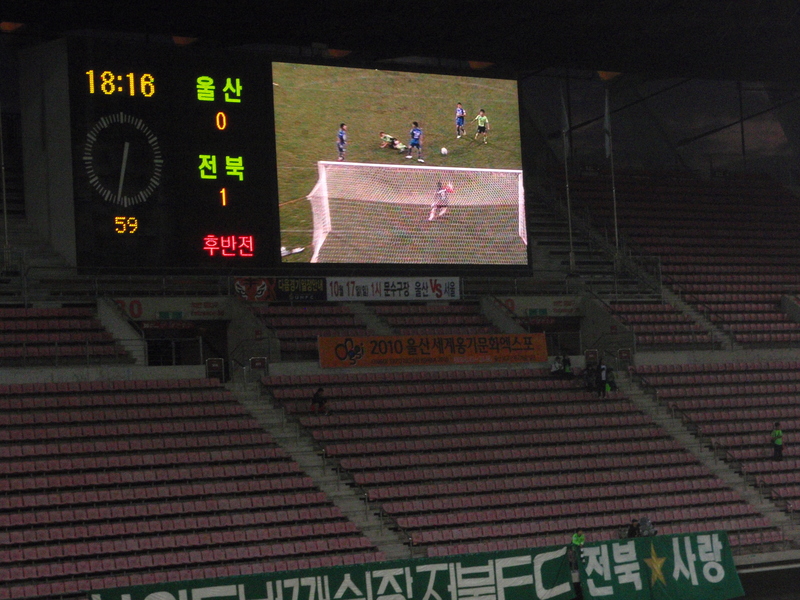 As I’m sure you suspected would happen, the missed chances came back to haunt Incheon in injury time. 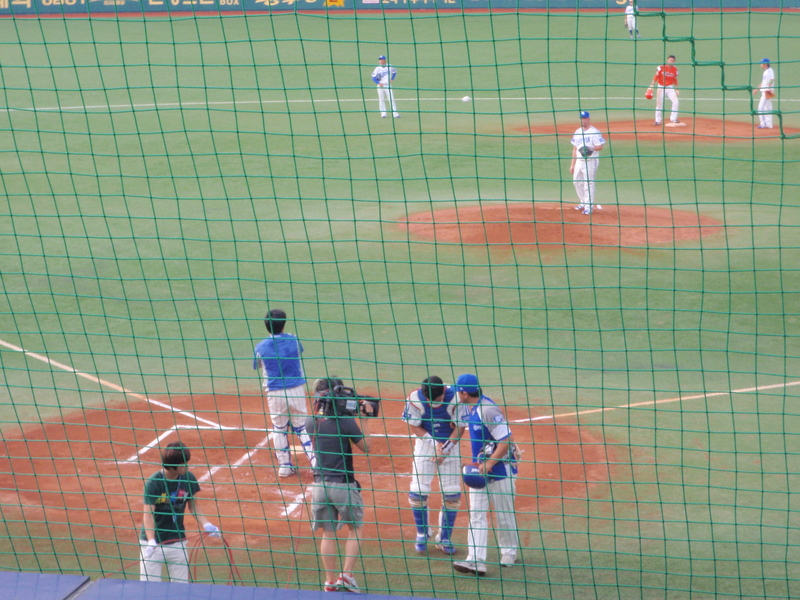 Park Won Hong, who had only been on the pitch for a couple of minutes, headed home for Gwangju after a scramble in the box to enable both teams to preserve their records of not having won since May. I checked later and the official crowd was given as 1,318. I’d have guessed at half of that at the most. Perhaps that’s what happens when you put the army team in a town with a reason not to be too keen on the military. 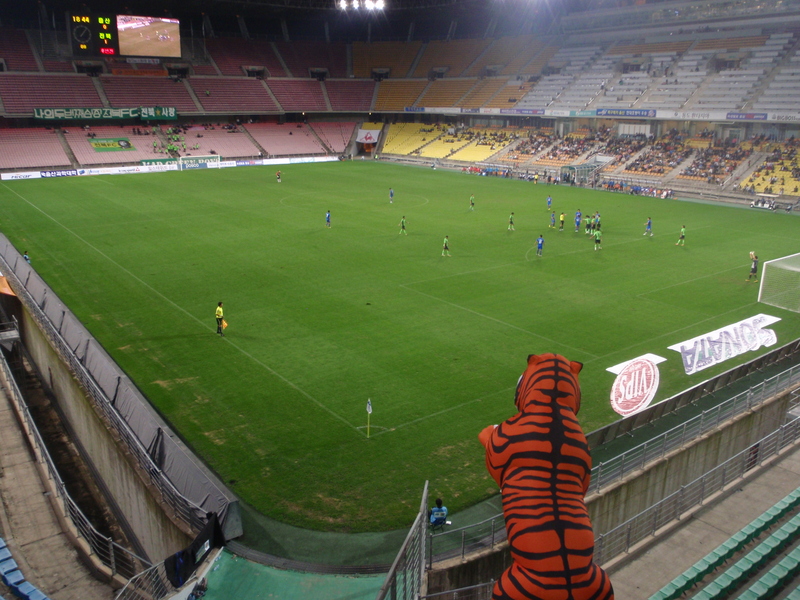 Meanwhile, back in the world where teams do occasionally win a match, Jeonbuk got beat 3-1 at home by Gangwon. 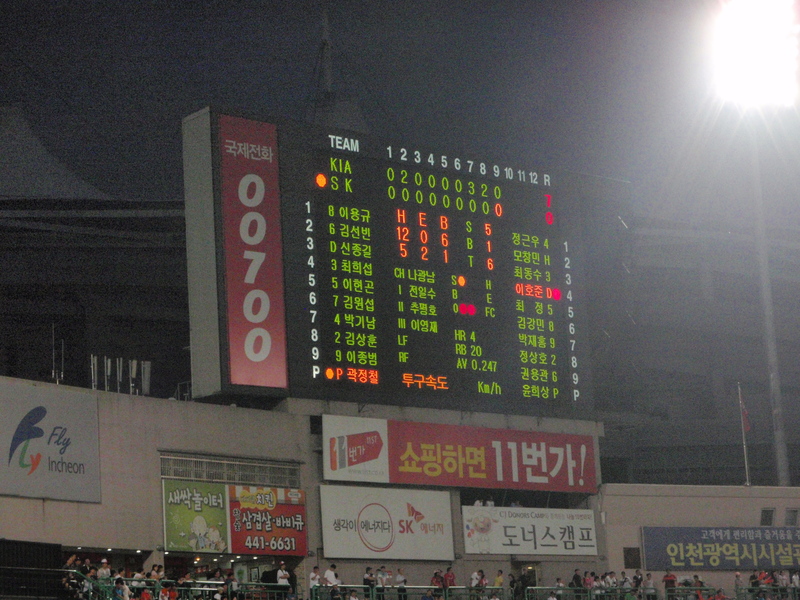 Lee Dong Gook played the entire game but didn’t score. 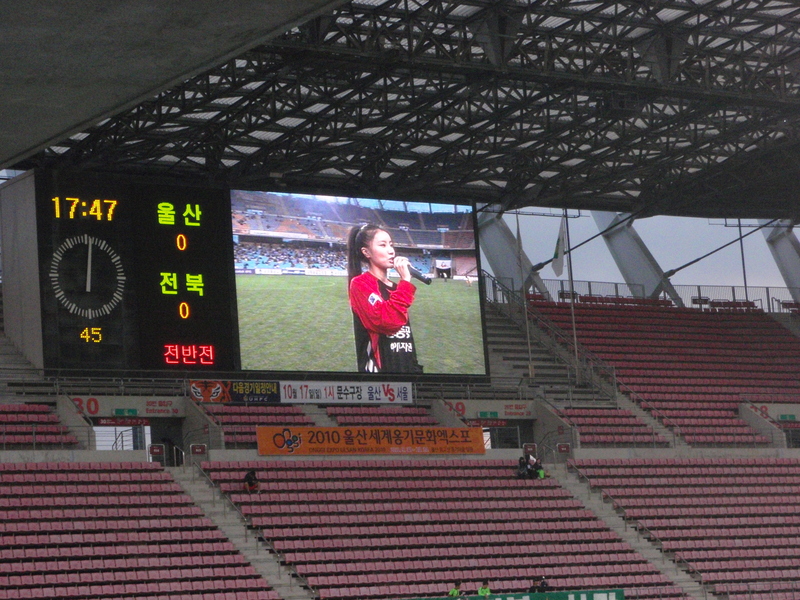 Still, at least he wouldn’t be doing sentry duty afterwards like the Gwangju players. 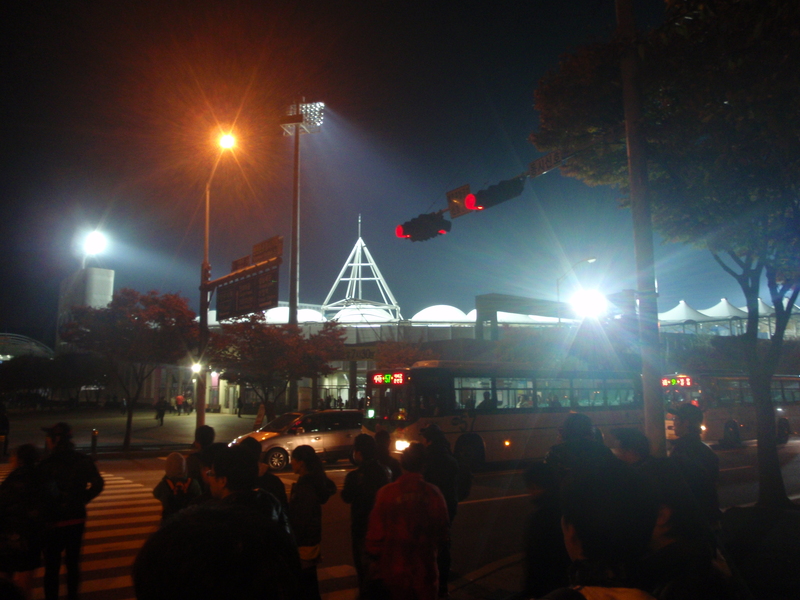 The result left Jeonbuk in fourth place, six points behind leaders Jeju United. On Wednesday, we got the day off work as it was Children’s Day. 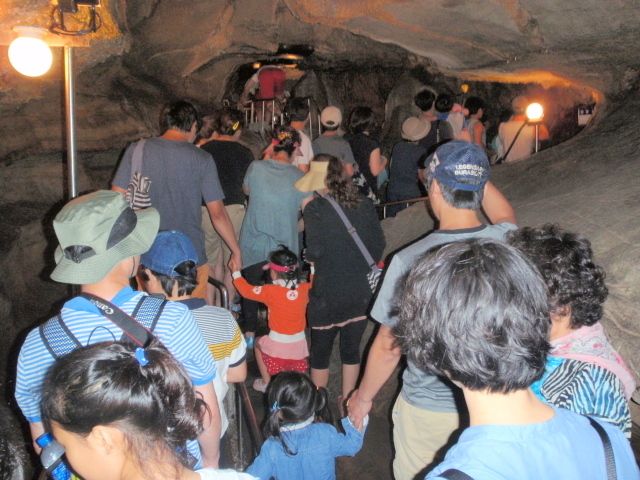 An excellent concept, in my opinion, where families are encouraged to spend the day together. 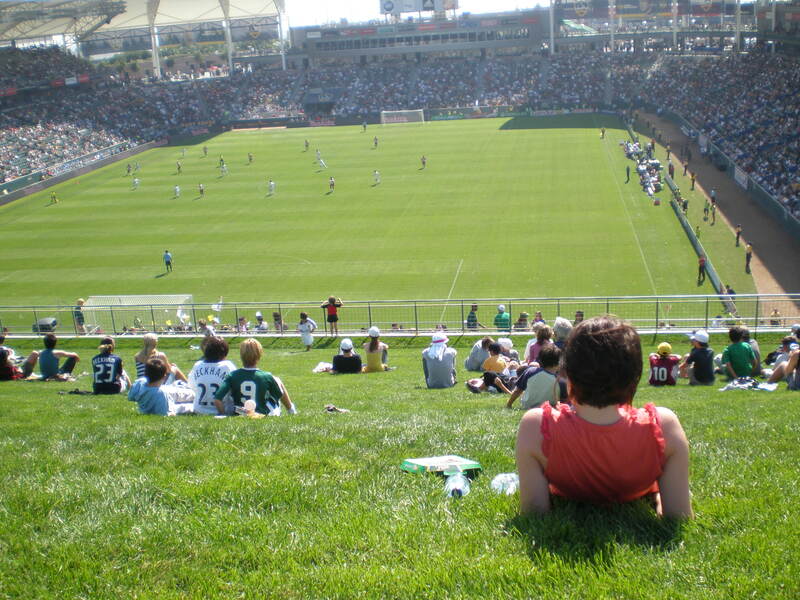 Unfortunately my children were six thousand miles away, so I decided to go to a football match instead. Somebody asked me recently if I miss them, now that I’ll only see them every four months or so, and I suppose that I do. Not as much as you might imagine, as I talk to them on the phone a couple of times a week and we send each other emails. What I do miss though, is them being children and there’s nothing I can do about that. I really enjoyed them being young. I have a great relationship with them as adults, but it’s not as much fun. 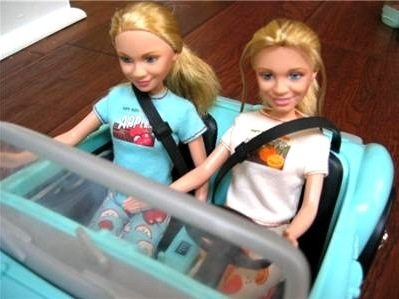 They have their own grown-up lives now and I’m a smaller part of it than I was when they were kids. It’s just the way it is, I suppose. I had a couple of different options for my choice of match. 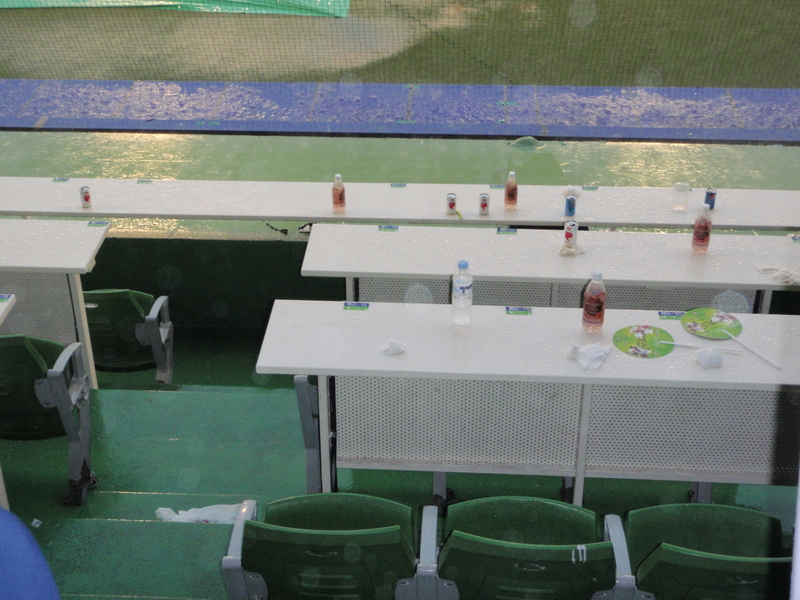 I had looked into going to Jeonbuk’s away game at Chunnam Dragons, but there didn’t seem to be a train back afterwards. 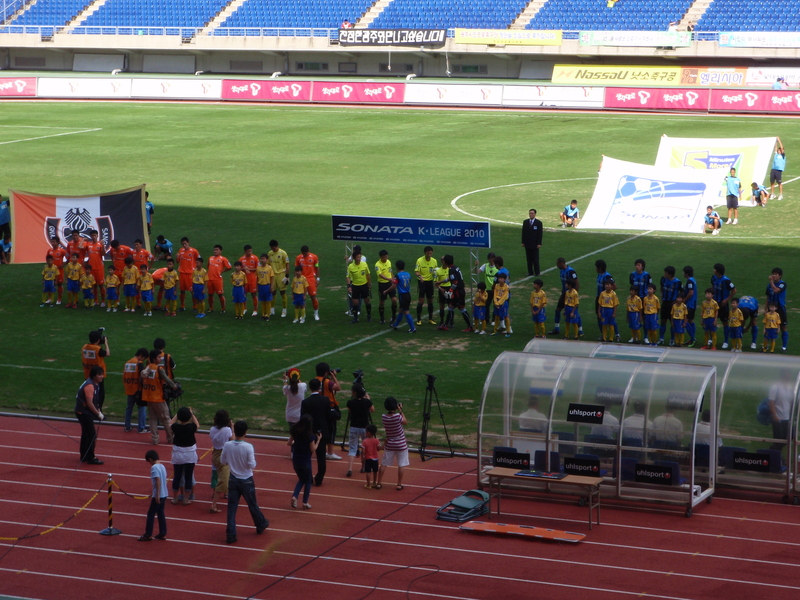 In the end I settled for Suwon Bluewings against Daejeon Citizen. 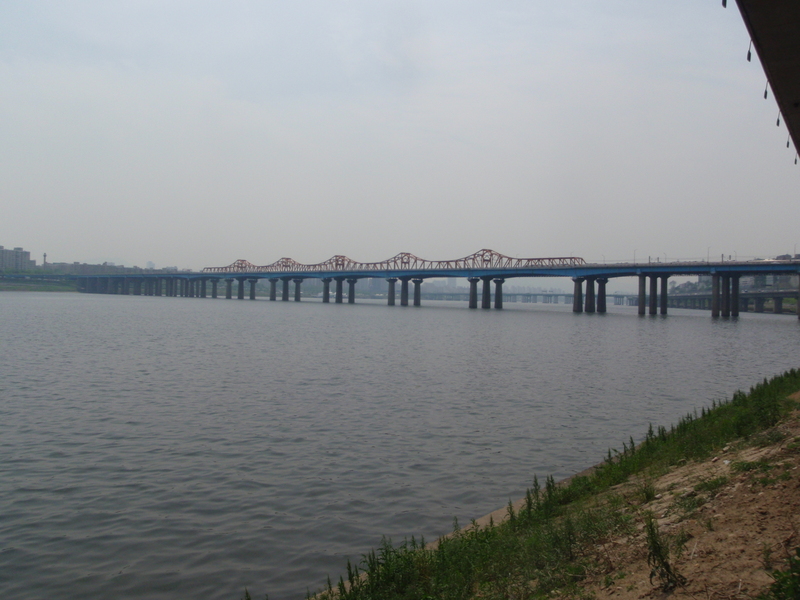 Suwon is a city just south of Seoul and you can get there with about an hours ride on the subway. 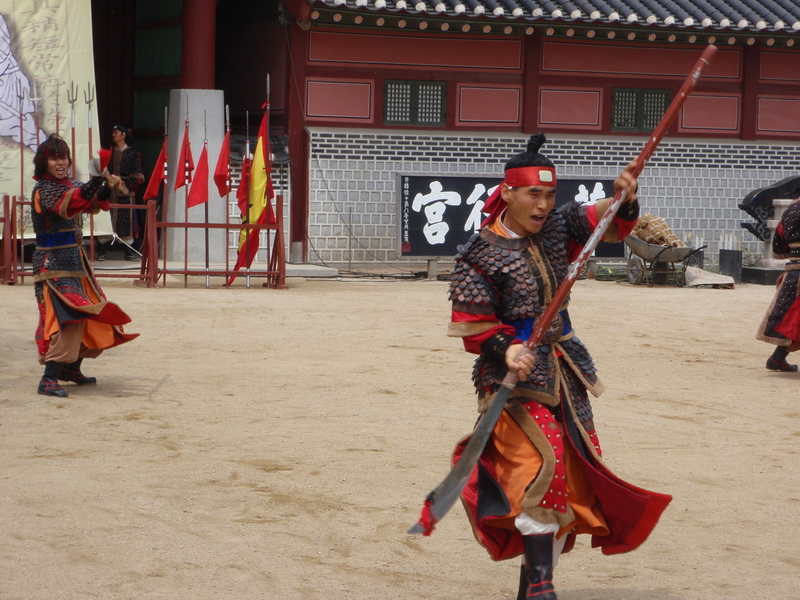 When I got there I took a bus to Paldalmun, which is one of the main entrance gates to the Hwaseong fortress wall. The wall runs around the old city, it was originally built over two hundred years ago and is about three and a half miles all the way around. I thought I might was well have a wander around it before going to the match. First though, I wanted something to eat. I stopped at a little café and had some pork dumplings. They were very nice, although as they had been deep fried I suspect that they probably weren’t too good for me. When I came out of the café I followed a sign for a palace, thinking that it would be something to do with the fortress wall. 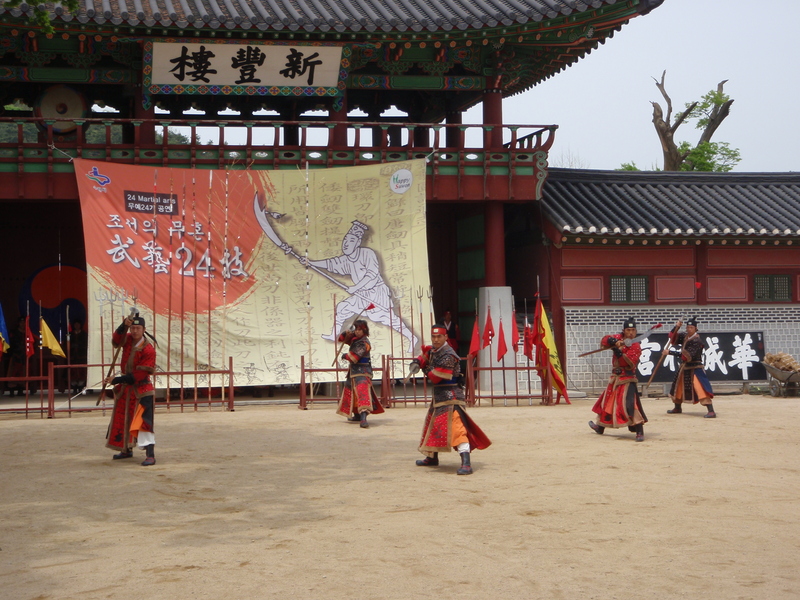 It wasn’t really, but there was a display of people dressed up in period costume, although which period I’d no idea, waving swords and sticks about. I watched them for a while and then conscious that I’d a wall to get around before the match I thought I’d better let them get on with cracking each others skulls and left them to it. On the way to the wall I passed a hairdressers. The barber’s shops here are denoted by a red and blue pole outside. The only problem being that only some of them offer haircuts whilst the rest of them are brothels. I think the general rule is that if you can see inside and they have barber’s chairs then you will probably get a haircut, otherwise you won’t. To make life difficult, some do offer haircuts as part of an overall package at, I imagine, a bit more expensive price than a regular trim. I had stuff to do so didn’t really have time to have some hairdresser fiddle with my bits afterwards, but I could have benefited from a haircut. It had been five weeks since the Japanese barber had shaved my head and some bits of it were starting to stick up at odd angles. The hairdresser’s shops have a different coloured pole to the barber’s, with a bit of yellow in them, so I thought I’d be safe with that. I went in and waited until the girl had finished with the old biddy in the chair. 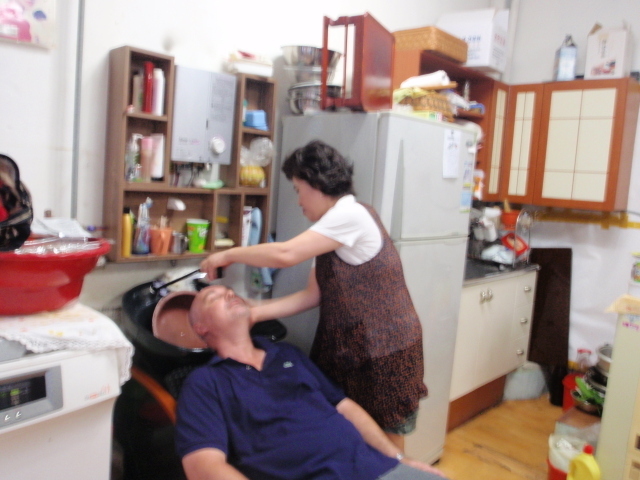 She didn’t speak any English, but I was able to mime the shaving of my head. To be fair, there wasn’t a lot else that she could have done with it. Maybe burnt the stubble off with a blowtorch, I suppose, but I was hardly likely to be looking for a curly perm or to have it highlighted. 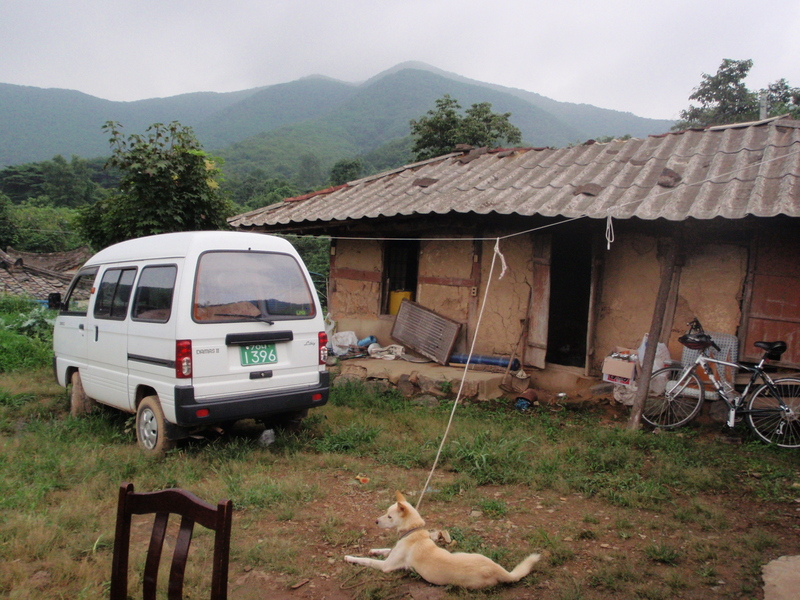 Ten minutes later and I was back outside after having my hair cut and washed for six thousand won. At that price I don’t think there was much prospect of any hanky panky. Around the corner was the start of the fortress wall. 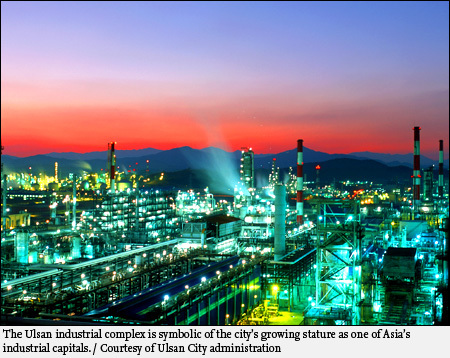 It had been quite badly destroyed during the Japanese occupation but had been rebuilt using the original plans. I’d picked an uphill bit to begin with and for the next fifteen minutes had a steady climb until I was able to look down on the town. The wall was an impressive sight, although I couldn’t help but think that it would have been breachable by anyone with a twelve foot ladder. Perhaps they didn’t have them in the olden days. I'd just walked up that. 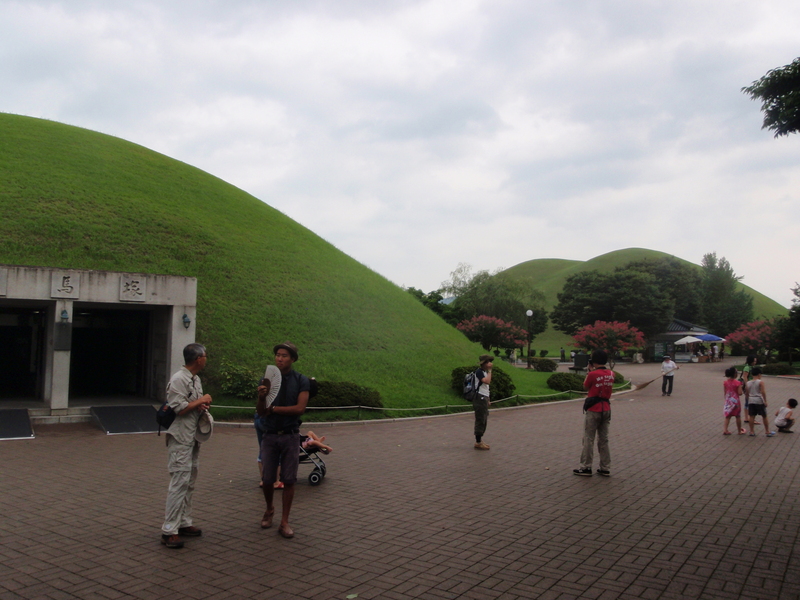 Every hundred yards or so was a gatehouse or a temple, all with helpful explanations in English. 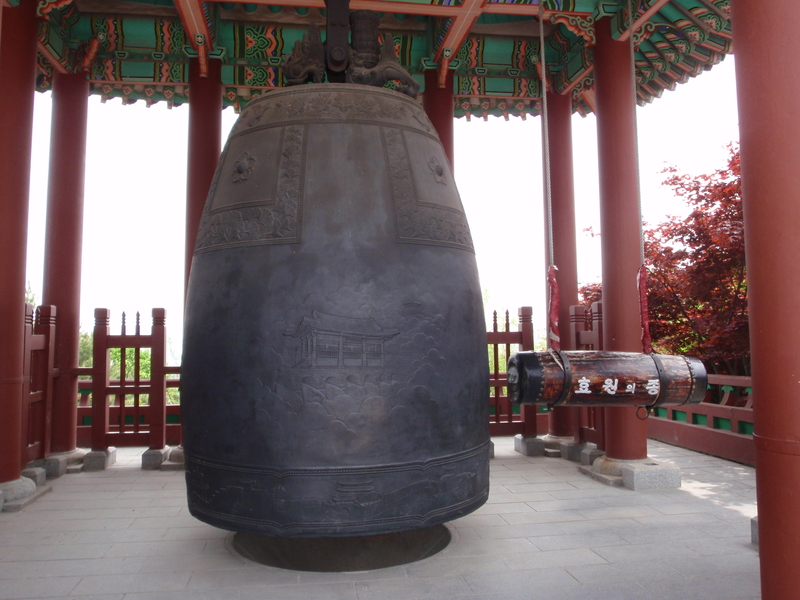 A bit further around was a great big bell that you could ring for a thousand won. You hit it with what looked like a railway sleeper on a couple of ropes and you got three goes. The first was meant to signify gratitude and respect for your parents, the second was for the health of your family and the third one was to bring about the realisation of your dreams. Well, I don’t have too many dreams, not if you exclude the recurring one with Konnie Huq and the baby oil, but I was happy to toll the bell in honour of my parents and the health of my family. I rang that. Three times. Job done, I continued around the wall for about another thirty minutes until I came to an archery ground. 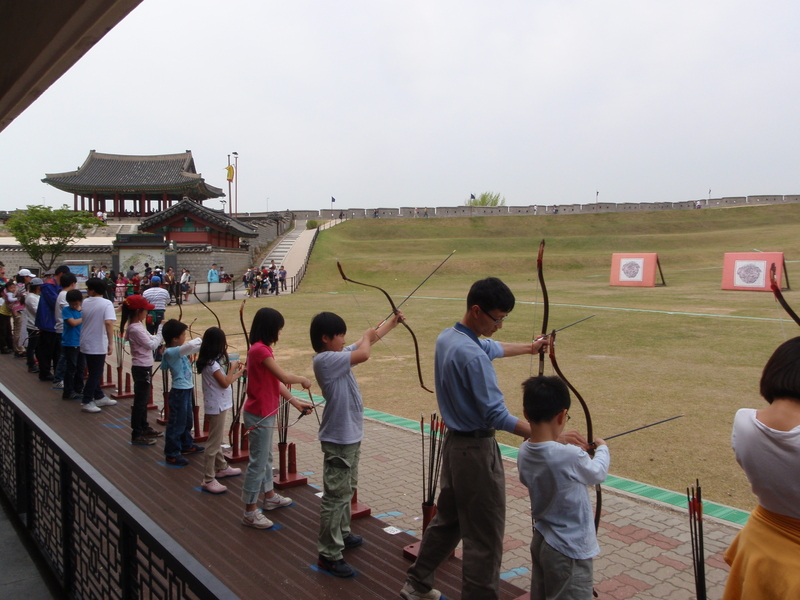 It being Children’s Day, there were plenty of families shooting at the targets. I watched for a while, recalling how I used to take my children to Sherwood Forest when they were small. My son would dress as Robin Hood and fire arrows at my daughter, who would have to be anything from the Sheriff of Nottingham to a deer, depending upon whatever storyline my son could think up. I’d spotted the Bluewings stadium from one of the higher points of the fortress and when I’d got about three quarters of the way around it was time to leave the wall and head for the stadium. 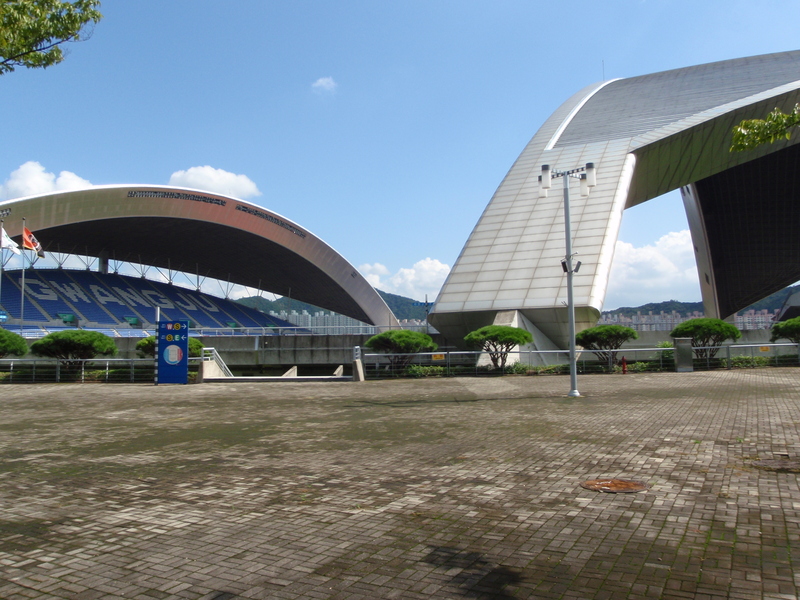 It had been built for the 2002 World Cup and had a very distinctive roof, shaped to resemble a pair of wings. 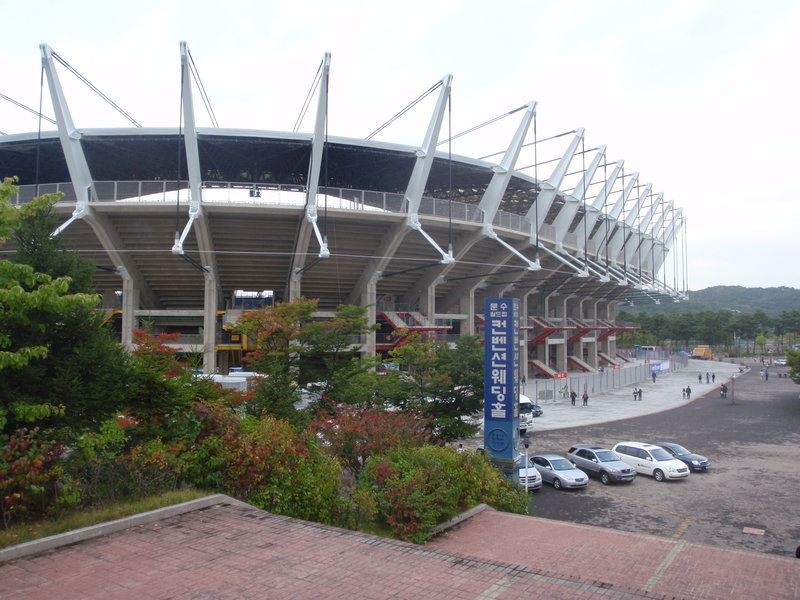 I bought a ticket for the East stand for 12,000 won, mainly so that I could get a good view of the winged roof opposite. There were no free pizzas this week, but we did all get given a banana on the way in instead. I wasn’t expecting a classic, Suwon were bottom of the league, with Daejeon just two places above them. 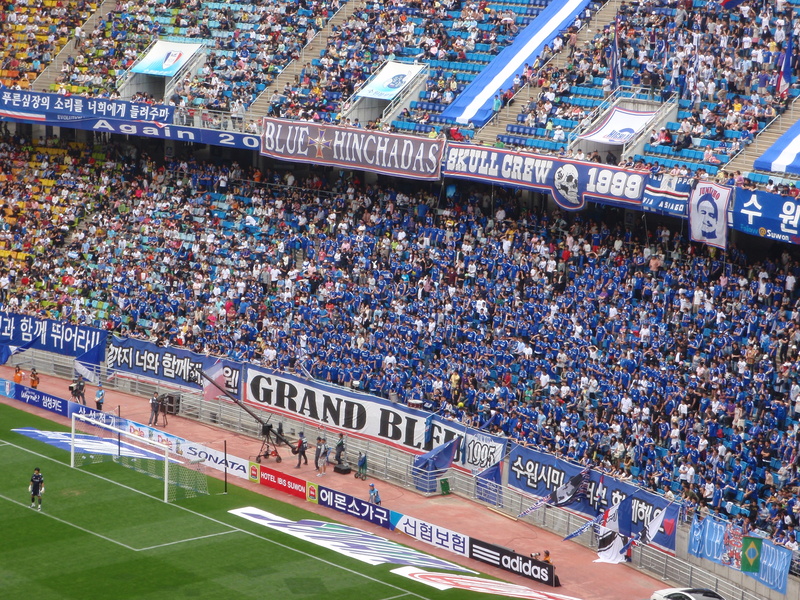 There isn’t any relegation from the K-League so it doesn’t have the drastic financial implications of relegation in England, but the Suwon fans weren’t happy with their lot. 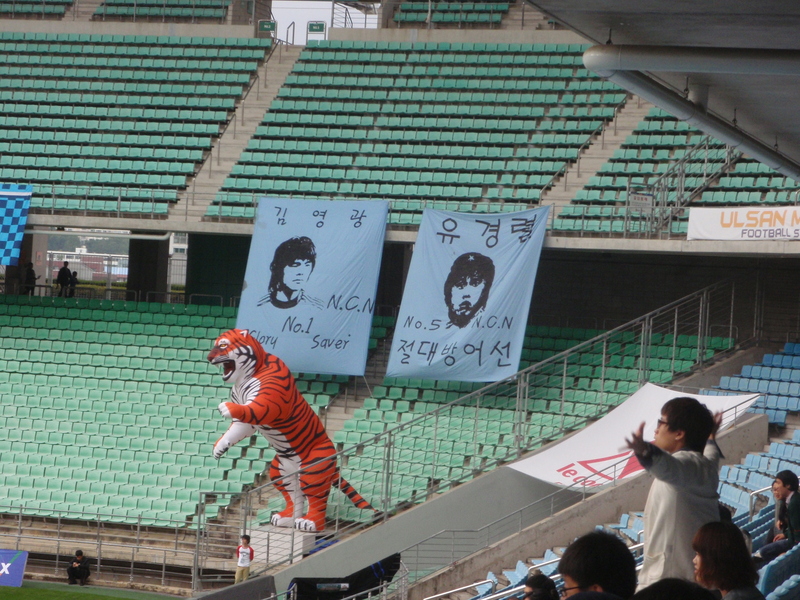 There had been a few protests against the manager, Cha, and the rumours were that if they lost today he would resign. 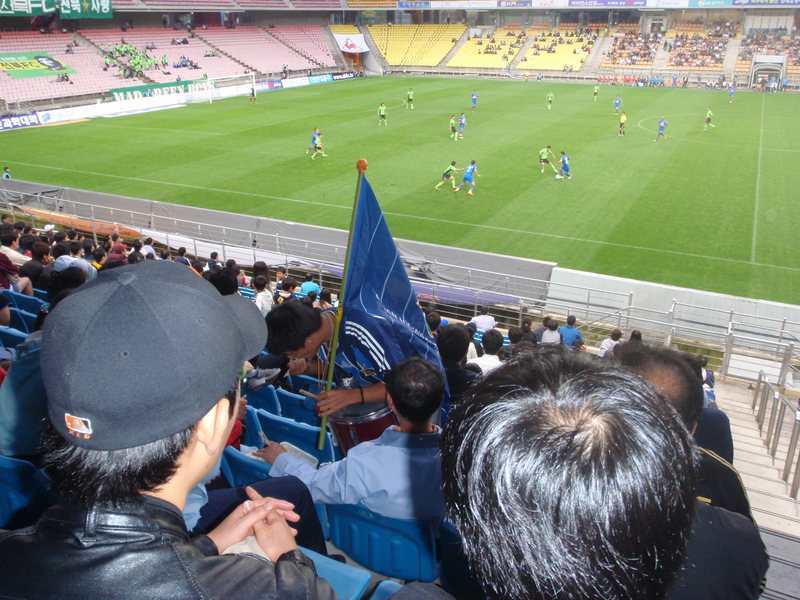 It was a decent sized crowd, with my stand being virtually full and with a lot of noise from the Suwon fans behind the goal to my right. 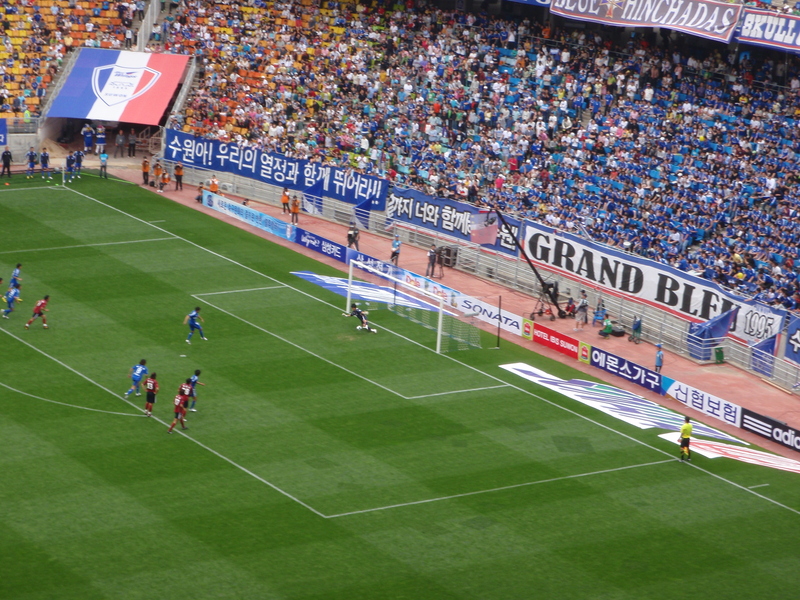 It was goalless at half time and the best chance of the second half fell to Suwon’s Brazilian substitute Juninho. Yes really, but not him, and not the one who used to play for Lyon and who possibly still does either. There must be a Juninho factory somewhere. Brazil I imagine. That would be the sensible place to have it. 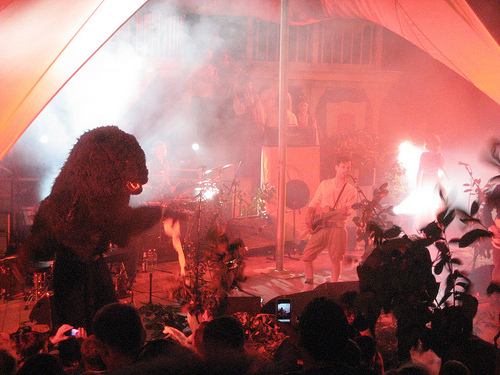 Anyway, I was hoping that the crowd might sing his song, so I could join in for old time’s sake. Any chance of that disappeared though when he hit a penalty straight at the keeper. Ole, ole, ole, ole, Juninho, ho, ho..
Daejeon lost a player with a quarter of an hour left when he gave the ref a bit of slaver and picked up his second yellow card. Despite the last few minutes being end to end stuff, it finished goalless. 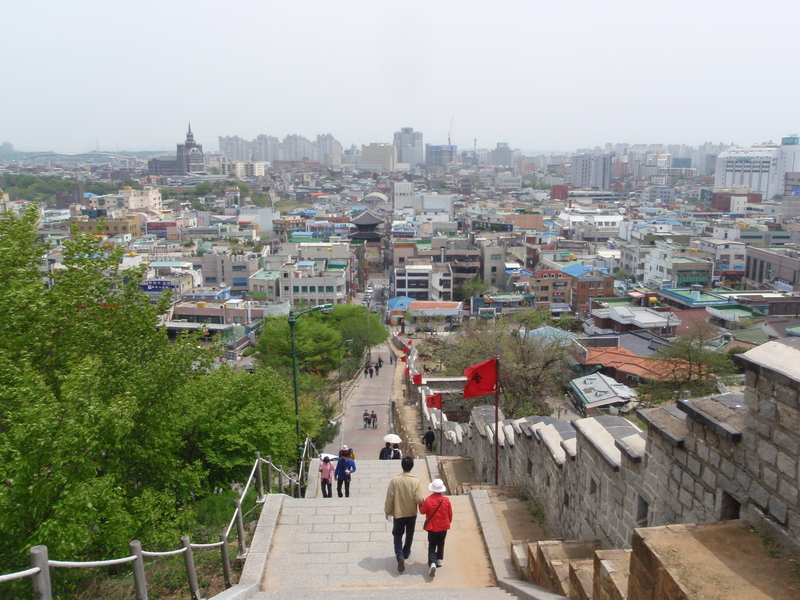 I ate my banana and headed back off to the fortress wall to finish the remainder of the circuit, before getting the subway back to Seoul. 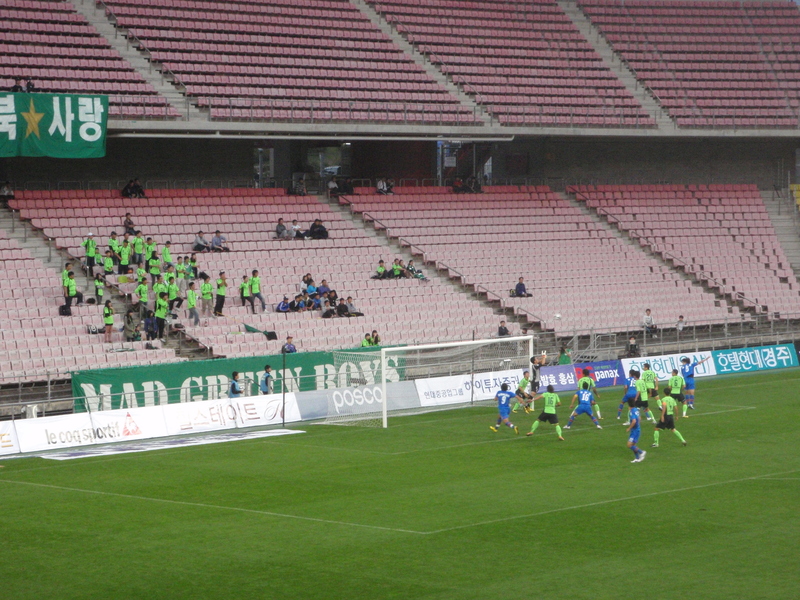 Meanwhile Jeonbuk lost 3-2 at Chunnam Dragons to slip to seventh place, five points off the top of the table. Lee Dong Gook didn’t get on the score sheet this week and was substituted after an hour.